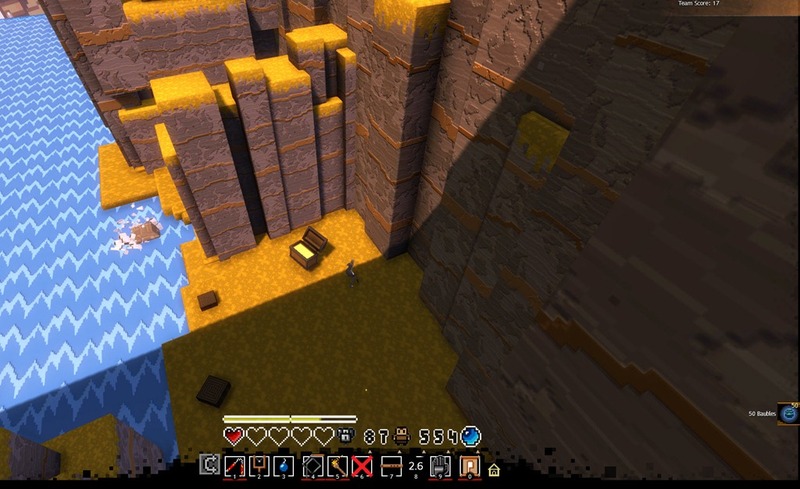 A list of all the known locations to dig for baubles with your shovel/digger inside the Super Adventure Box. Updating for 2016 release. 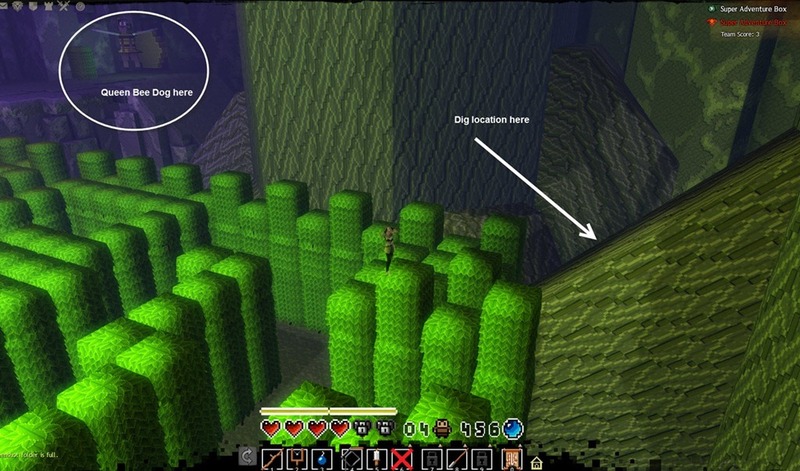 Note: All of the locations can be dug once per instance and can be only dug once per day. This does not work in infantile mode so you can only dig in Normal or Tribulation mode. Areas you can dig have a golden dust marking on them and you will dig up a chest containing 5-20 baubles with some chests giving 50 baubles. W2Z3 to be added for 2016 release. 1. 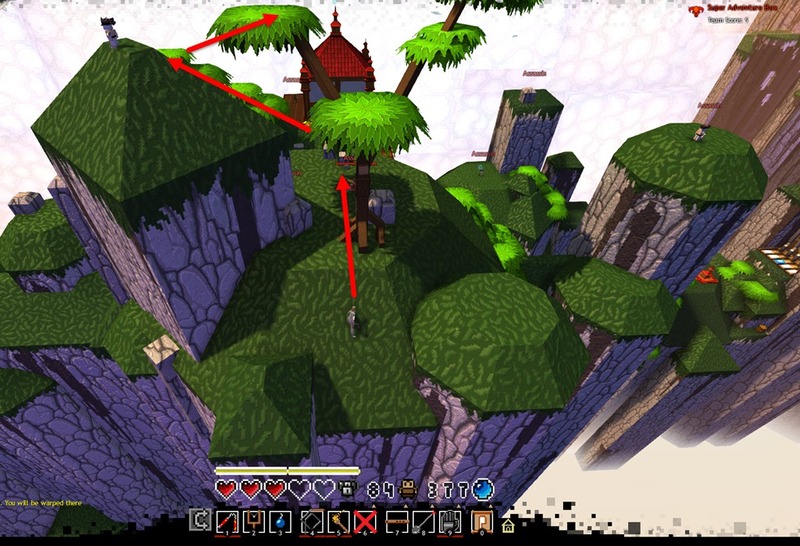 Between checkpoint 1 and 2 is the hill with the chest on top. 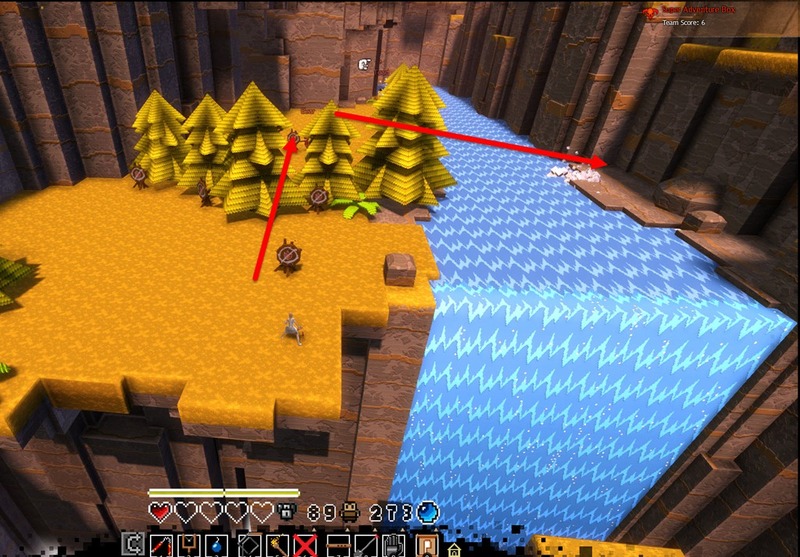 From that hill, you can do two separate jumps, If you take the left path (yellow), it will take you to a spot. . If you take the right path (white), it will take you to another spot. Each chest gave 20 baubles. 2. 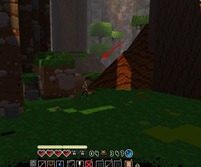 Also before to the first checkpoint, it is to the left of the checkpoint in the dark forest. 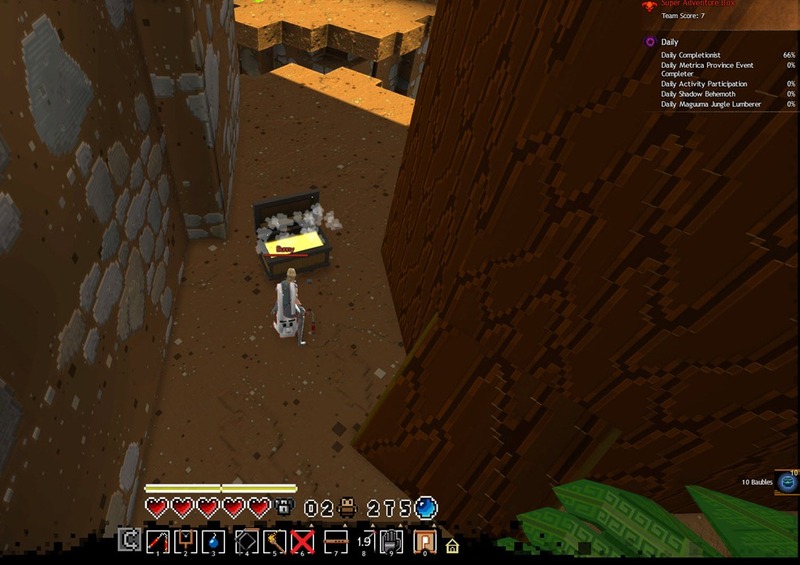 You will find a dig spot with a chest containing 20 baubles. 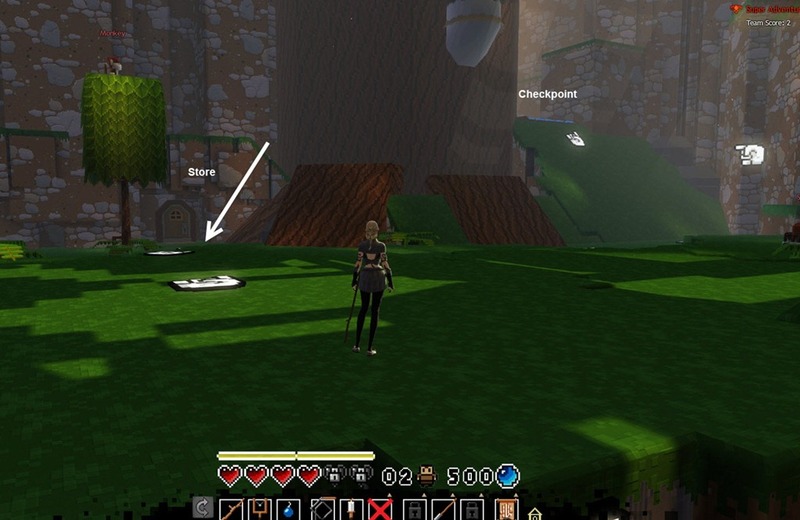 3.There is stump after the first checkpoint right next to the horizontal trunk on the ground that you can pass through. 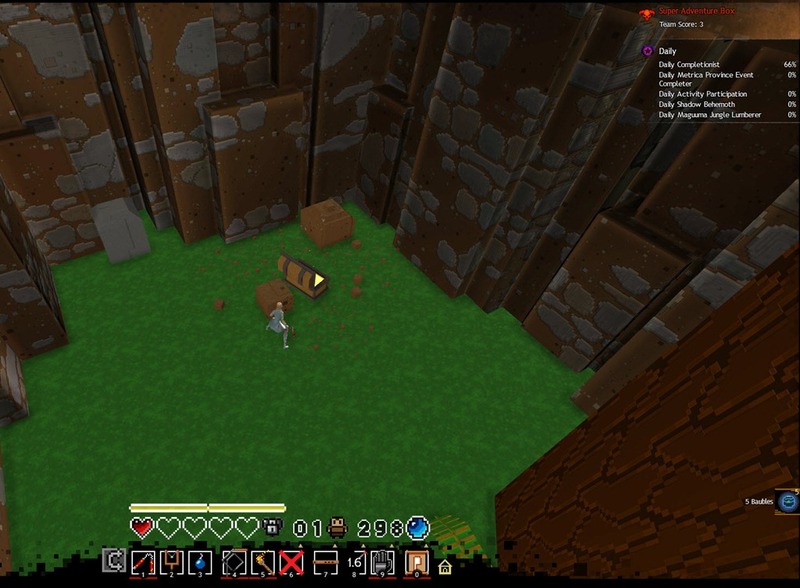 You can dig up a chest with 5 baubles. 4. 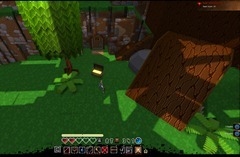 Near the stump, a bit to the right, is a ledge you can dig up a chest (+10 baubles). 5. Right before the second checkpoint is a store. 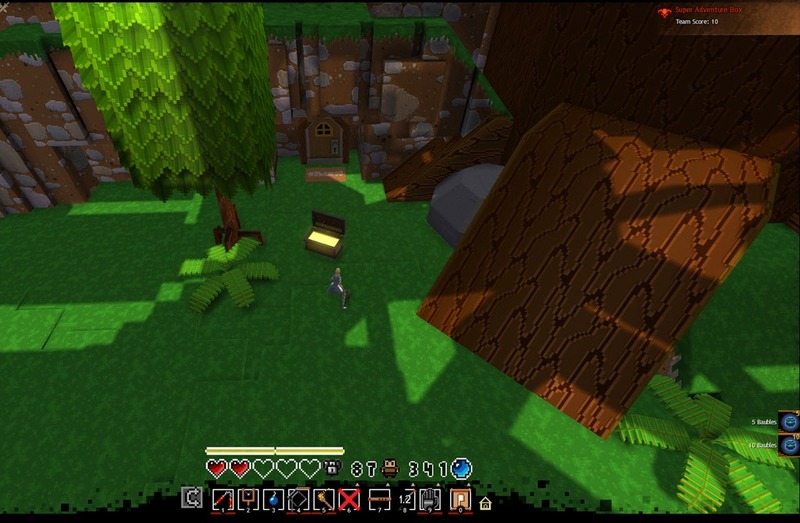 In front of the store you can dig up a chest for 15 baubles. 6. In the pond right after the second checkpoint, dig in front of the first leaf thingie to reveal a purple bauble behind it containing 20 baubles. 7. 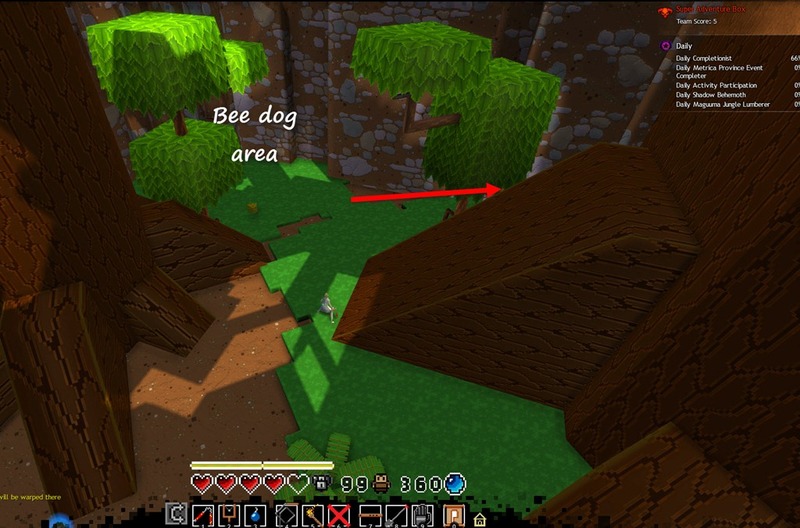 The ground after the second checkpoint contains the entrance to the Queen Bee Dog room.in a corner. Inside the room, directly across from the Queen Bee is the large tree. 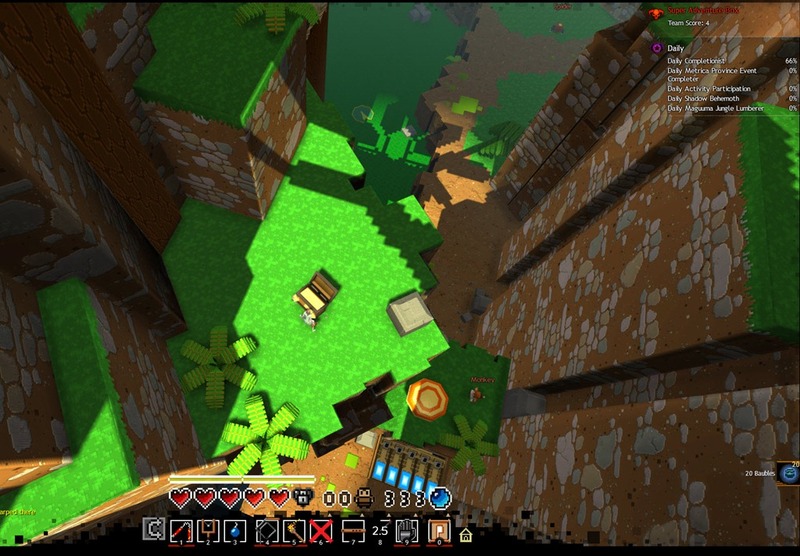 You can jump on the tree roots and then jump up via the leaves to get to a grassy area where you can dig up a chest containing 50 baubles. 8. 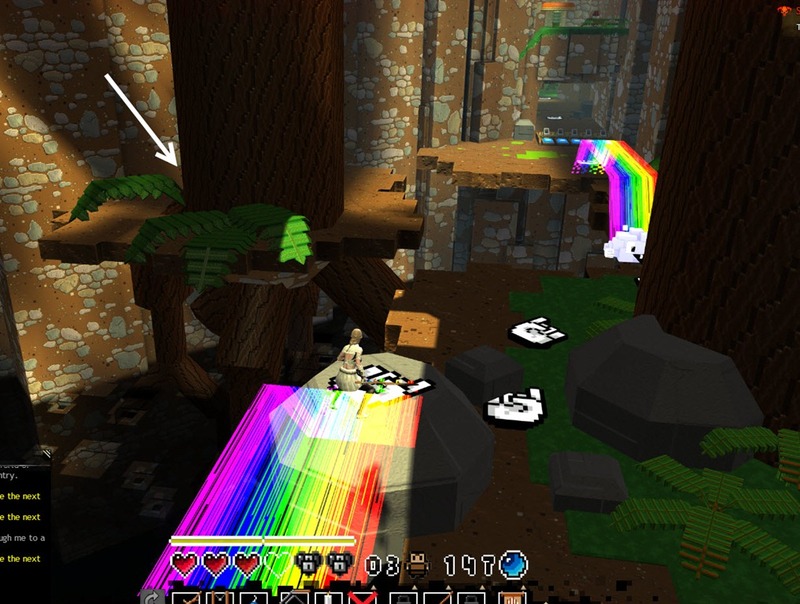 Go back to the area where you entered the Queen Bee Dog room this time you want to take a right path and you will find a hidden corner where you can dig up another chest containing 20 baubles. 9. 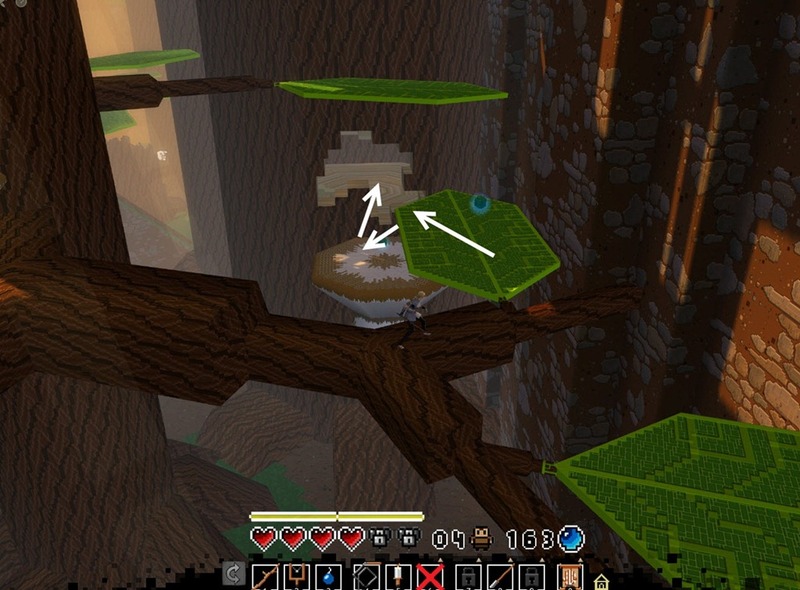 Also after the second checkpoint, if you go up in the canopy, you will remember this mushroom cap you used to backtrack to the higher canopy in the area between checkpoint 1 and 2 (also the secret spider area). 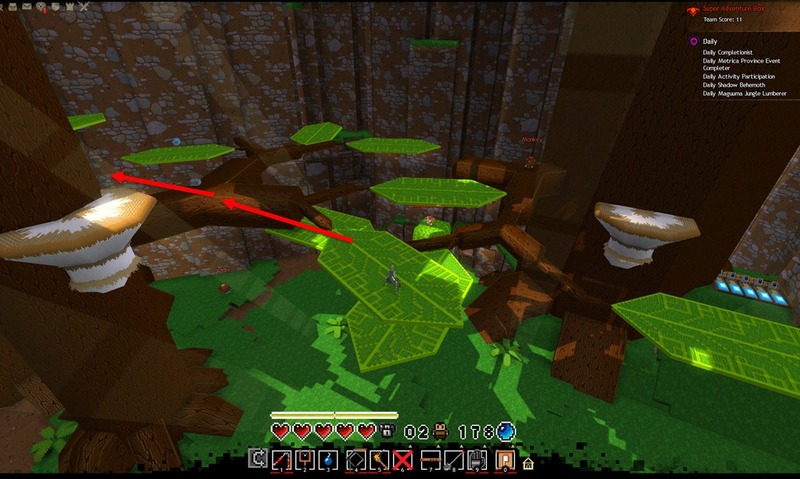 In that higher canopy is a big vertical trunk that you can pass through with six baubles at the top you can collect. 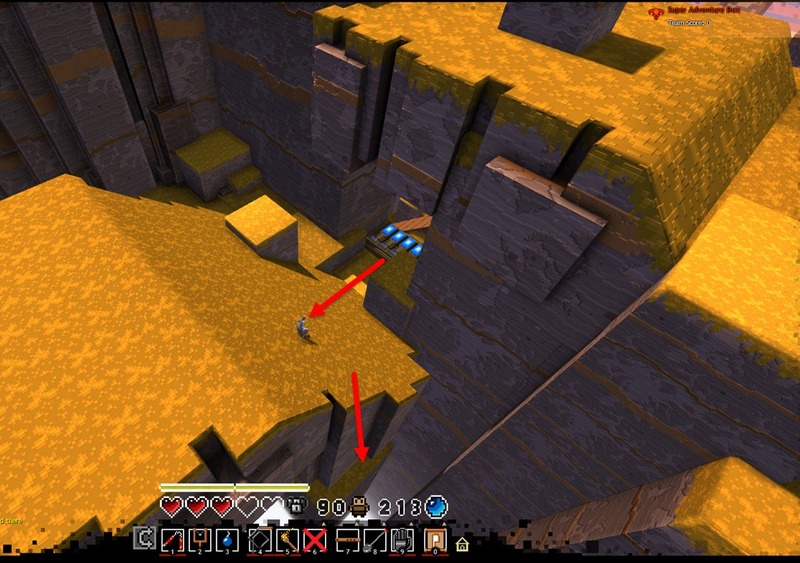 Normally you would take the right path to get up top but this time take the left patch to jump to a ledge there. 10. 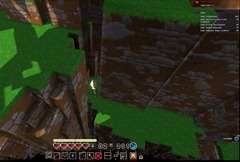 Right after the third checkpoint, don’t jump down after passing through the checkpoint (if you do jump down, you can get up again via the two mushroom caps). There is a chest to dig for 20 baubles. 11. 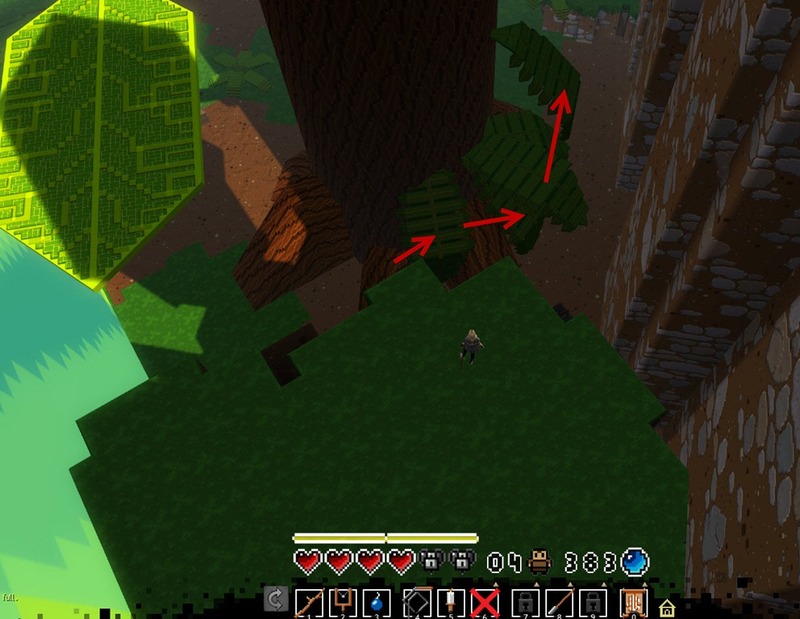 Right before the last checkpoint is an island to the left of it with a big tree. 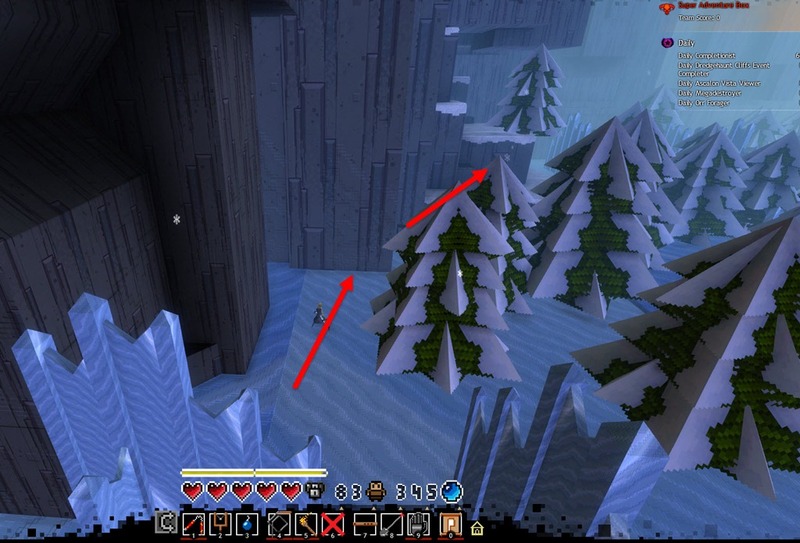 There is a dig spot between the tree and the wall that reward a bauble chest with 10 baubles. 12. 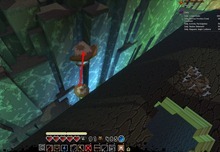 The last checkpoint before the miniboss (cage) fight, you have to use the one time checkpoint boost to get up to the bouncy mushroom cap that will get you up to a ledge containing a chest you can dig for 20 baubles. Don’t leave yet! 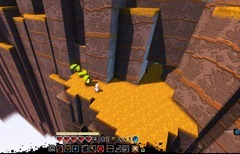 On the same platform, there is another spot to dig for chest with +10 baubles for +30 baubles in total! 13. For this one, you need to backtrack a bit back to shortcut wurm. 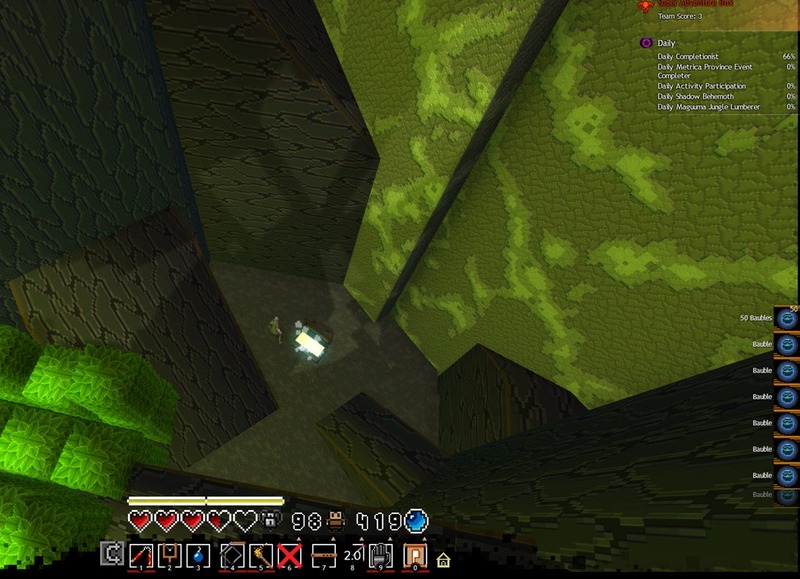 Right after you exit the shortcut wurm, dig around the brown square on the ground for a chest containing 5 baubles. 1. Near the start of the zone is a chest you can dig up with 20 baubles after a series of rather long jumps. 2. 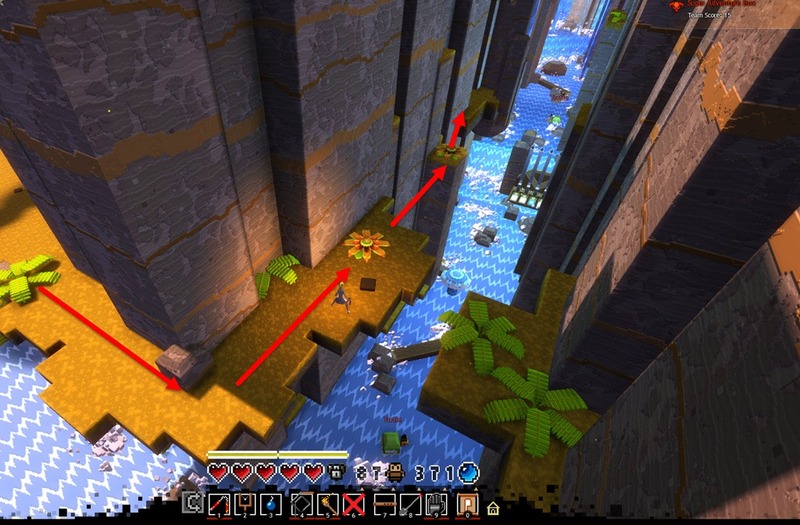 Right before the first checkpoint, take the wooden log up and cross six flowers to reach this ledge where you can dig up a chest containing 10 baubles. 3. 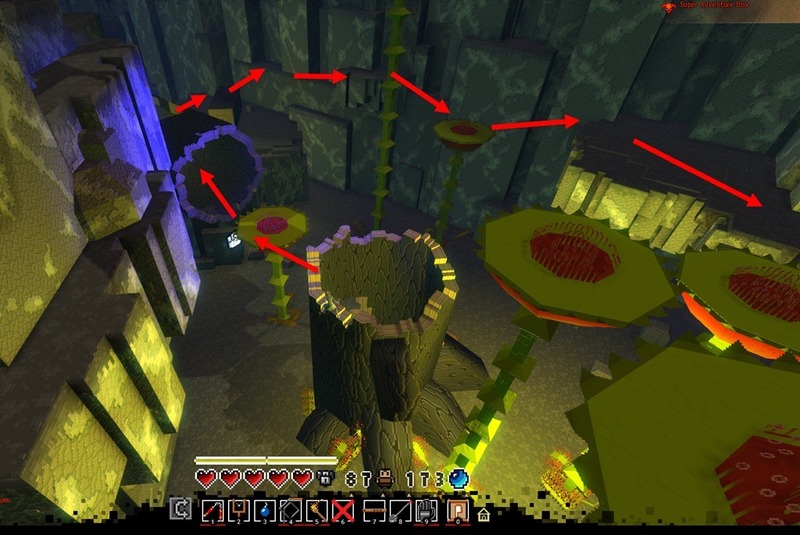 Inside the maze that ends with the Queen Bee Dog (before checkpoint 1), there is a place to dig for a chest containing 20 baubles. 4. In the same maze, there is another spot where you can dig up a chest giving you 50 baubles. Orient yourself with respect to the Queen Bee and you can find it easily. 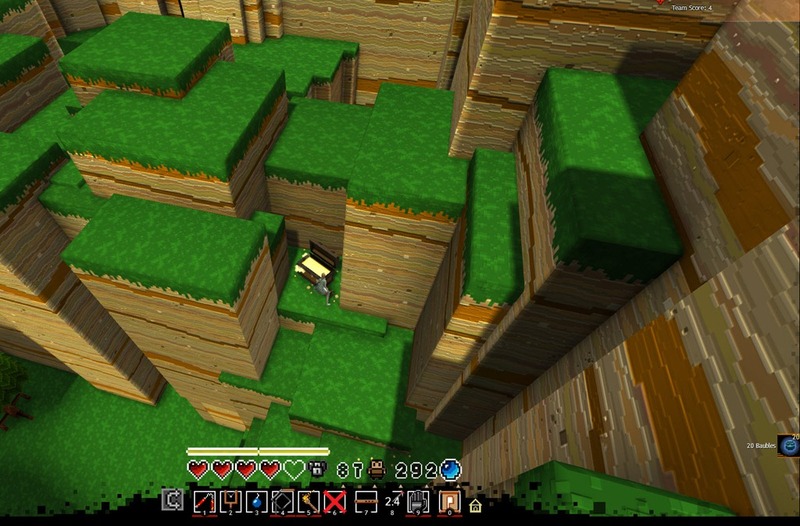 Remember that you can scale the top of the maze from the back where the Queen Bee Dog is so navigate through the maze first. 5. Before the final checkpoint with the King Toad boss, there is a huge horizontal log high above the air which you can get to by using the top checkpoint and going through a bunch of falling leaves. 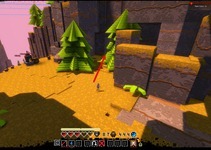 To the right of that log is a platform you can jump to which you can dig for a 50 bauble chest. 6. Jump back to the horizontal log and run through it. 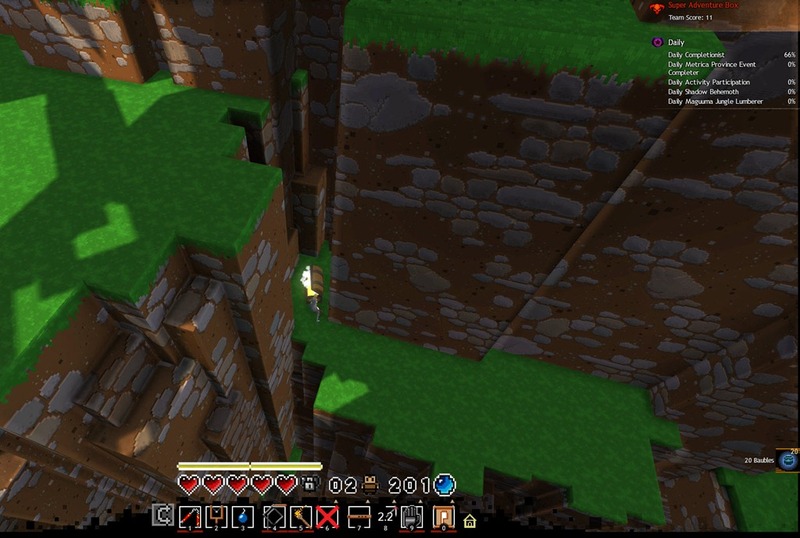 At the end, you can jump to a ledge nearby with another chest you can dig for 20 baubles. Special thanks to reader Risa Aerulight for all the hardwork in locating these digging locations! 1. 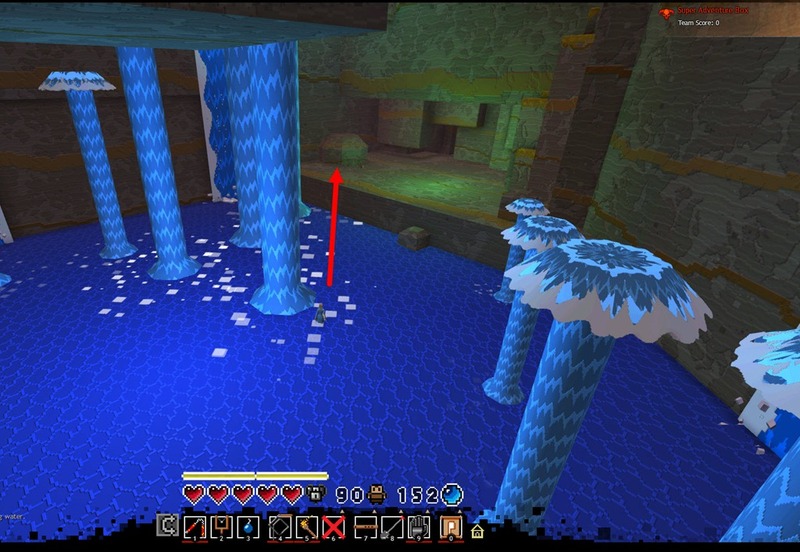 Before the first checkpoint in the hidden room behind the waterfall with all the water sprouts.Dig there for a +20 bauble chest. 2. This is after the 1st checkpoint. 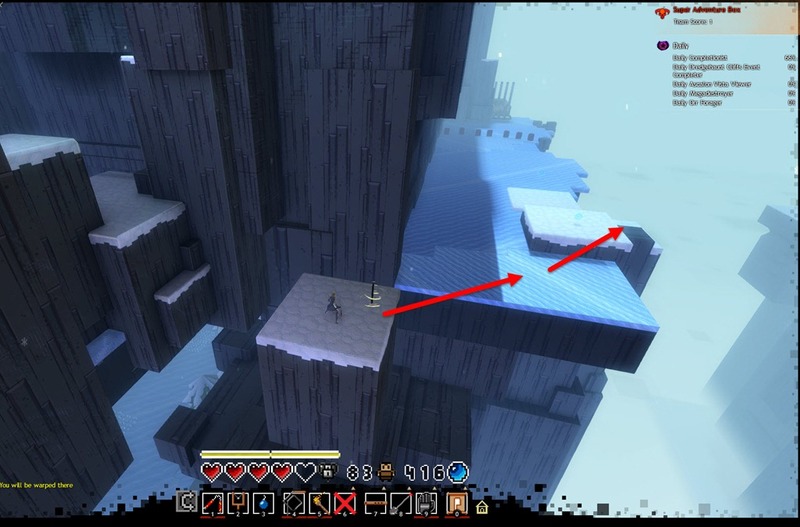 There is a ledge behind the waterfall you can use to help you get across to the other side. Dig for 20 baubles. 3. 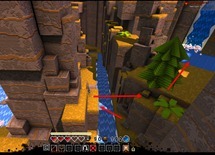 From the 2nd digging location, follow the bend of the river and then make it to this smaller stream at end of the river. 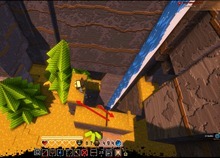 Jump across it and then go up so you can jump across it one time time to access the top area with the waterfall where you can dig up another chest containing 20 baubles. 4. 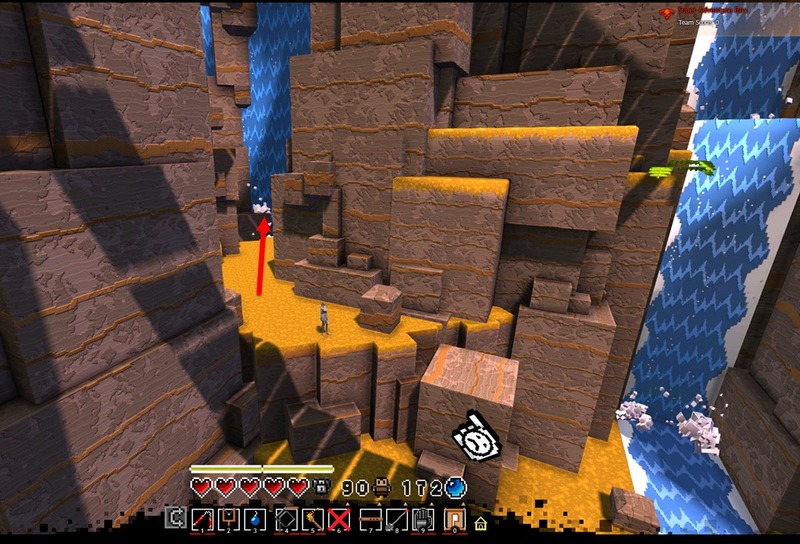 Right after checkpoint 3 is a ledge you can drop on the right (if you run past the checkpoint and turn around to face it). 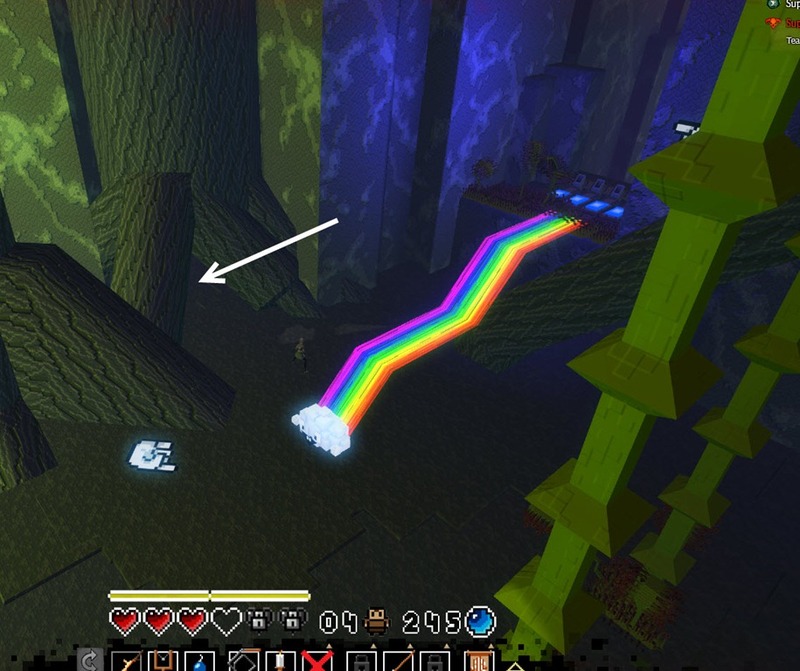 You can dig there for a 50 bauble chest. 5. Past checkpoint 5, go through the trees/bear and then jump across the river. You won’t make it to the other side of the river but that is okay as the water doesn’t push you back as much. Dig there for a 20 bauble chest. 6. 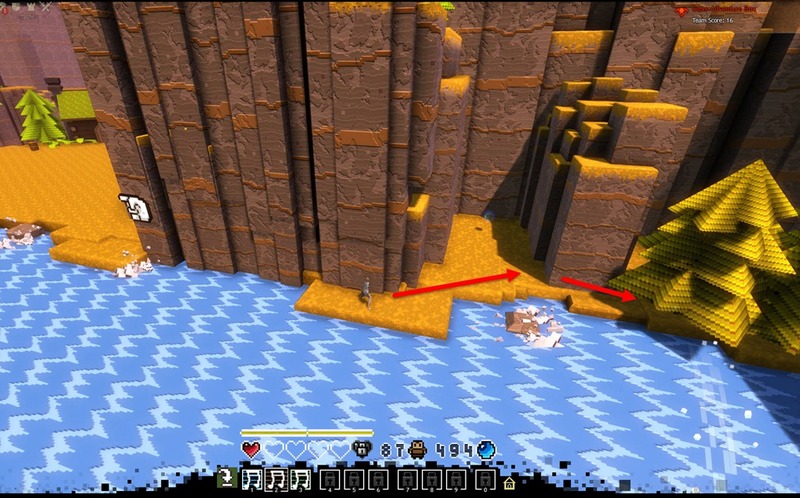 For the next digging spot, go back across the river and go back to the big chasm. 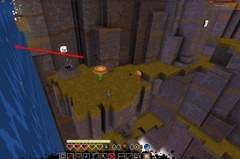 Jump down on the flower below and go through an underground cave. 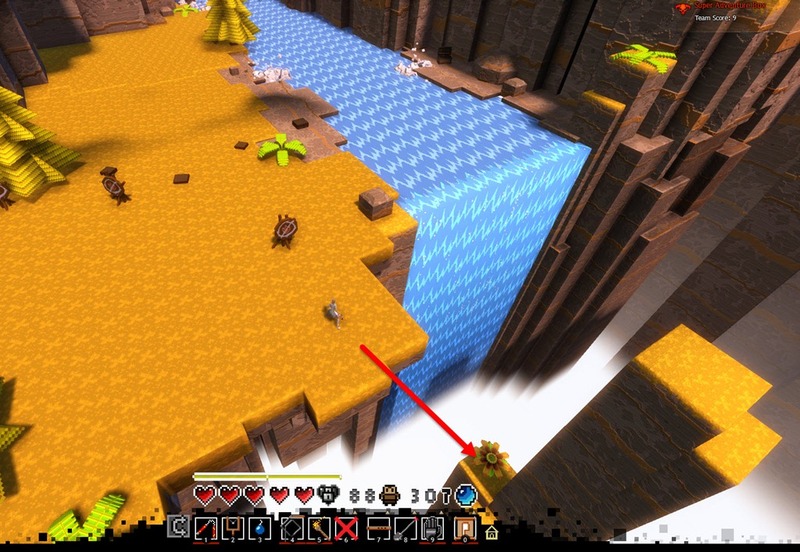 Once you are out of the cave, jump your way across the river and on the ledge guarded by a frog you can dig up a 50 bauble chest. Don’t jump off the ledge after this. 7. 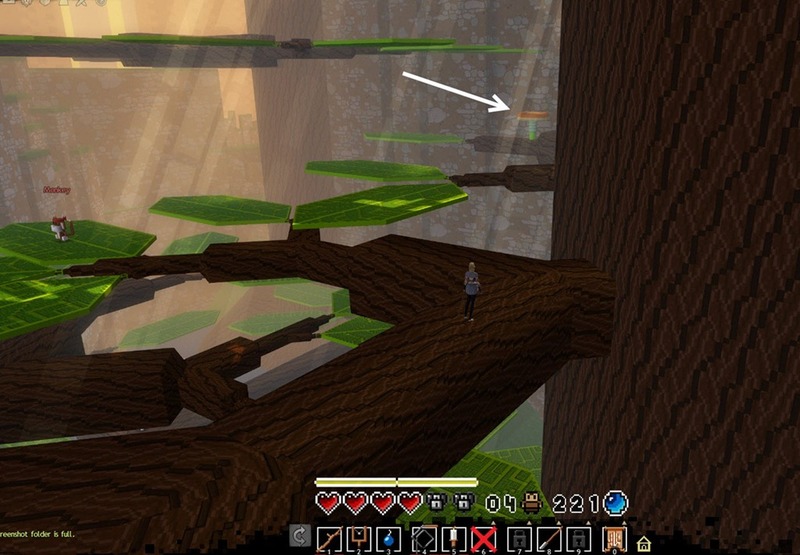 Go backwards following the ledge and you will see a tree you can burn to reveal a spinning flower on the other side. 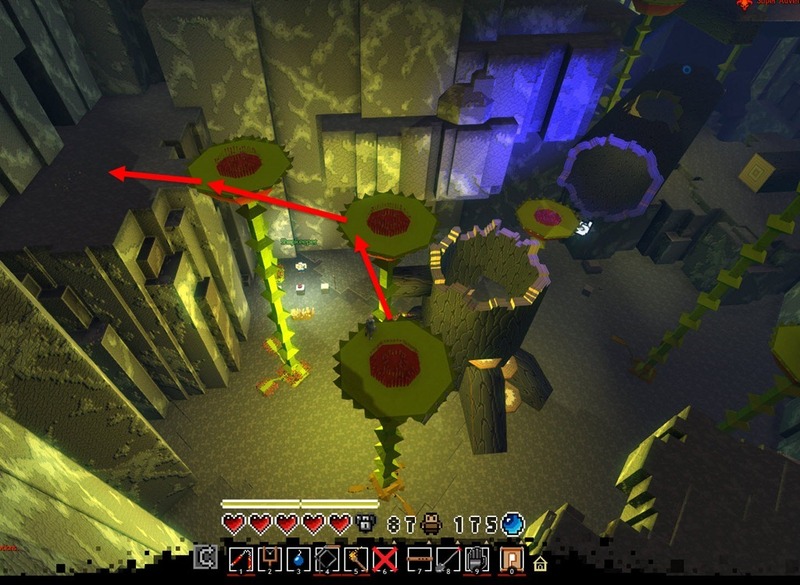 Take that flower and the next one to get to a ledge right above checkpoint 6 where you can dig up a +20 bauble chest. 8. 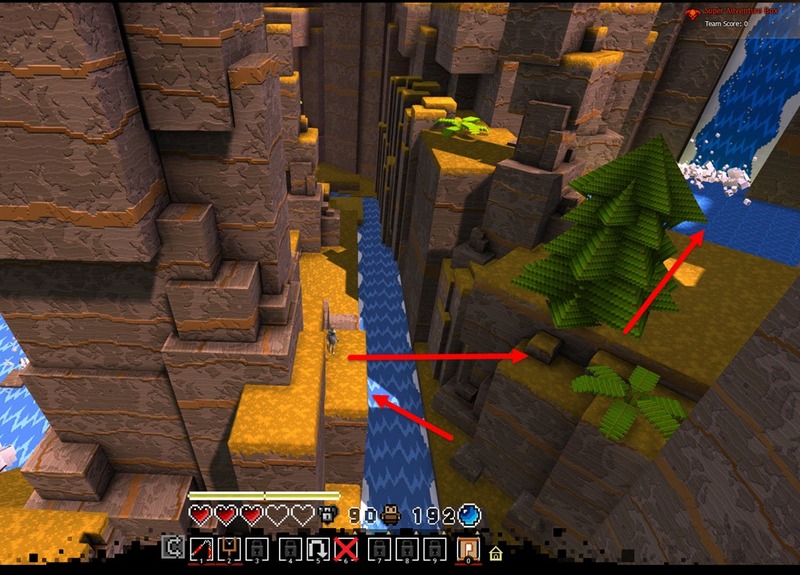 Get to checkpoint 7 and immediately turn left to climb up and go past the waterfall. You will find a ledge you can bomb for a hidden room location. Dig there for a 50 bauble chest and bomb the wall to reveal the furniture shop where you can get some furniture coins as well. 9. After checkpoint 7, go through the Racoon maze and keep going right. You will find a dead end you can dig up a bauble chest containing 20 baubles. 10. Also past checkpoint 7, run past the hillbillies and carefully drop down below. 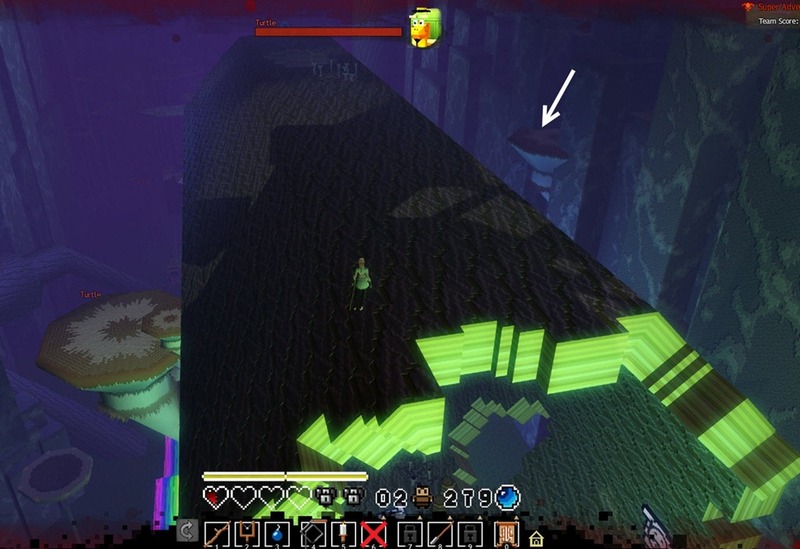 Go through the hidden river and bounce on the two mushroom jump pads to get up top. Dig for a 20 bauble chest. 11. 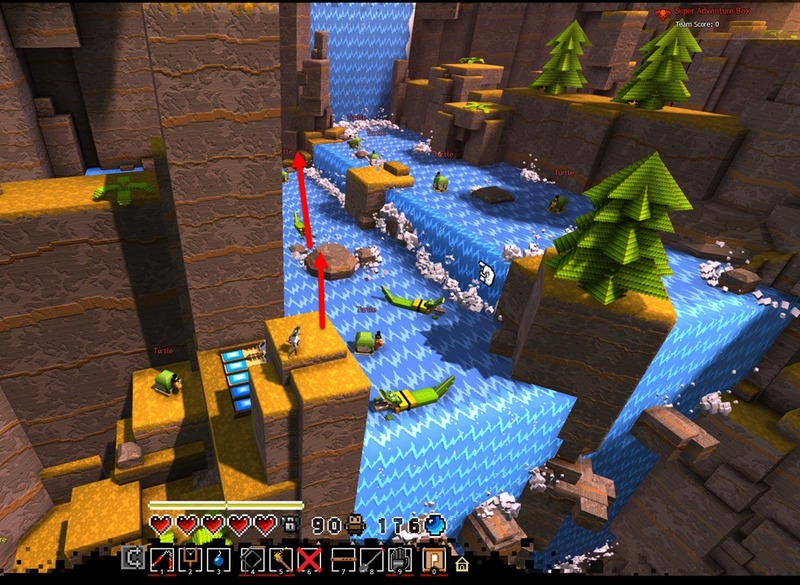 Right across the frogger river, burn the trees and dig up a +50 bauble chest. 12. 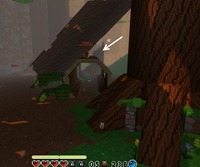 At the waterfall with the falling logs, there is a green hidden room right above the teleport that port you up. Try jump into it or jump into a log falling down and just hold down W when you get close. +50 bauble chest you can dig here. 1. To the right of Checkpoint 1. Dig for +50 bauble chest. 2. Past checkpoint 1 but before checkpoint 2, there is a lone tall rock under an assassin that can be dug for a +20 bauble chest. 1. This first one requires you to have learned the secret song 332331 from hidden room #8 in W2Z2. You want to enter the Raccoon maze near the hillbillies before checkpoint 1. Hug the left side until you reach a “mouth” like wall you can open using 332331 on your flute. Once you are inside the mouth. You can to jump to the very top and then drop down on the other side. At the bottom, you want to take a left instead of right that will take you to the polar bears. 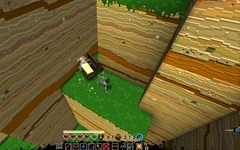 The digging location is inside a corner where you can dig up a chest containing 50 baubles. 2. 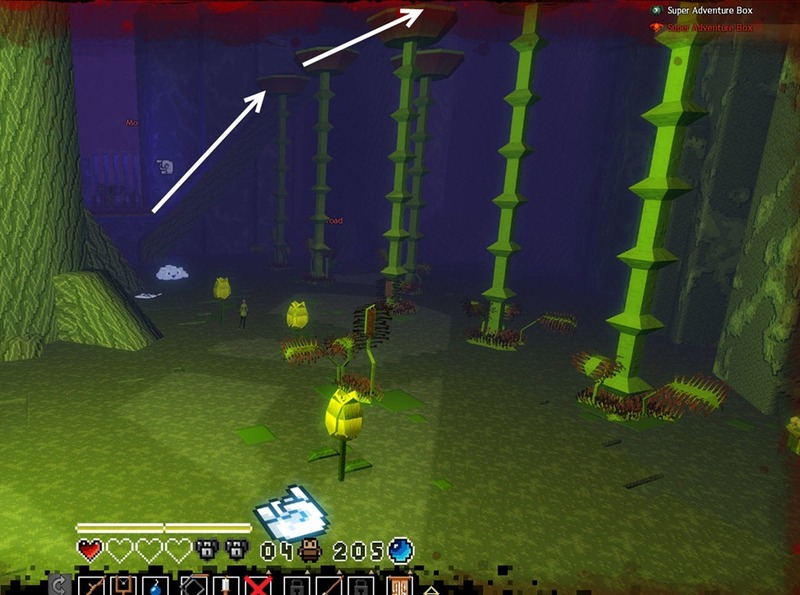 Past the second checkpoint you will find the place with all the “mouths” trying to blow you as you cross. You want to jump down to the side near the 1st “mouth” and pick the hole on the right side to drop down. 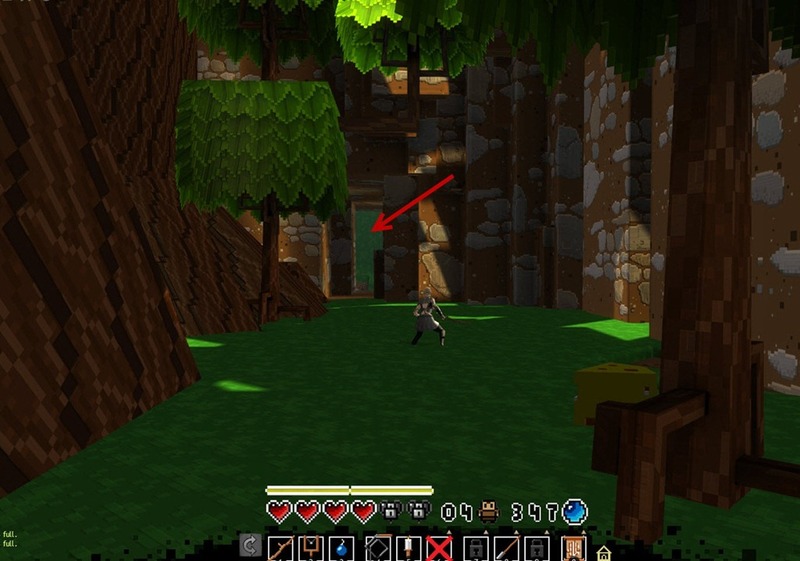 This is a door where you can push to access the Raccoon Kingpin but you just want to dig here for a +50 bauble chest. 3. After you get past checkpoint 4 (it is the checkpoint next to a block where you can push with your gloves). You drop down a tunnel like structure and push the door open to proceed to the next area. 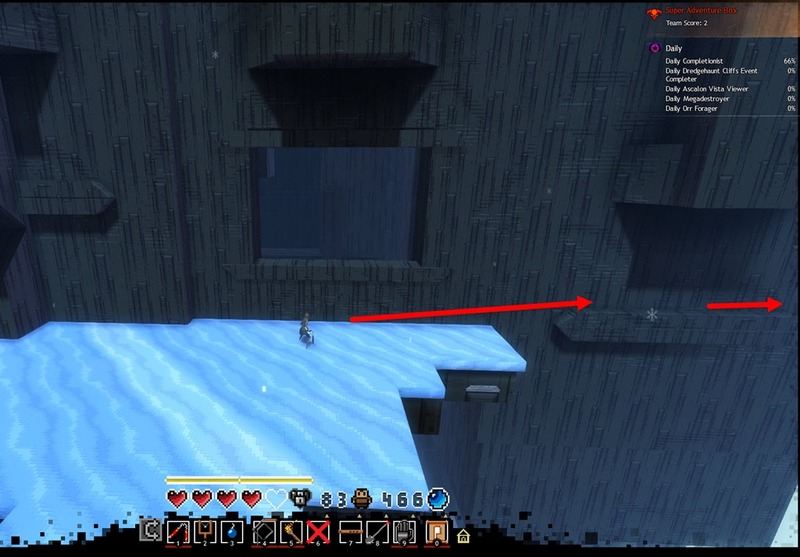 To the left of that door are some ledges you can jump on and then dig for a chest containing 10 baubles. 4. 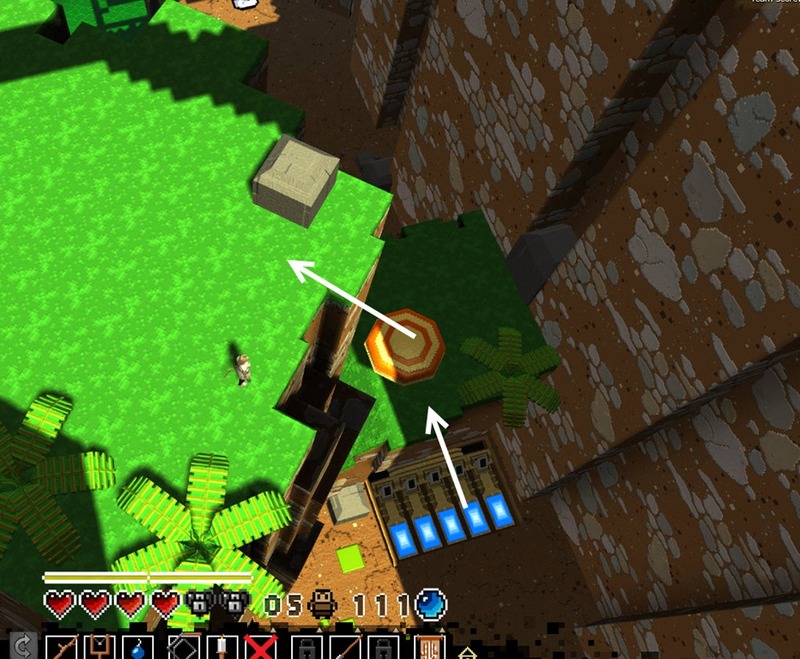 After digging spot #3, you will need to hop down and set up the teleporter that will take you to the location with the jumping goats. 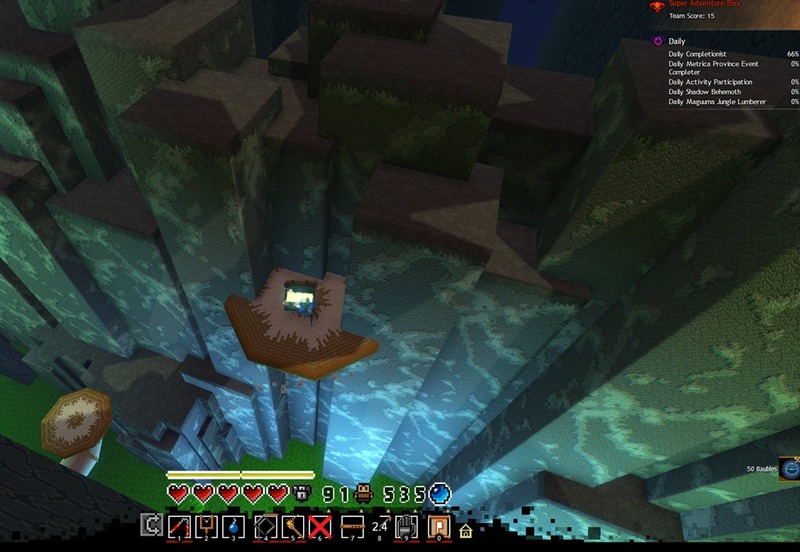 Take the teleporter to the jumping goats and jump off it to dig for a 10 bauble chest. 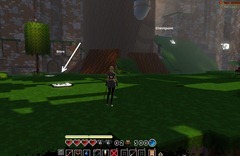 There is a small grassy platform near the Queen Bee Dog minibox in zone 2(I think). When you enter the zone(2? ), bees will grab baubles from the flowers and fly off to where the Queen Bee Dog hides, down a back alley. 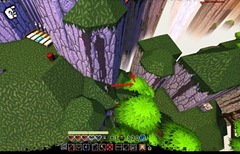 After you’ve dealt with the Queen Bee Dog, go up the tree’s jumping puzzle(start by standing on the tree leg behind it and jumping up onto leaves), jump across the 2-leaf canopy and onto the grassy platform and dig. I don’t have a screenshot to share though =( I think it gave around 20, can’t confirm right now though. Digging spots are changed now any got a new video or spots of it? 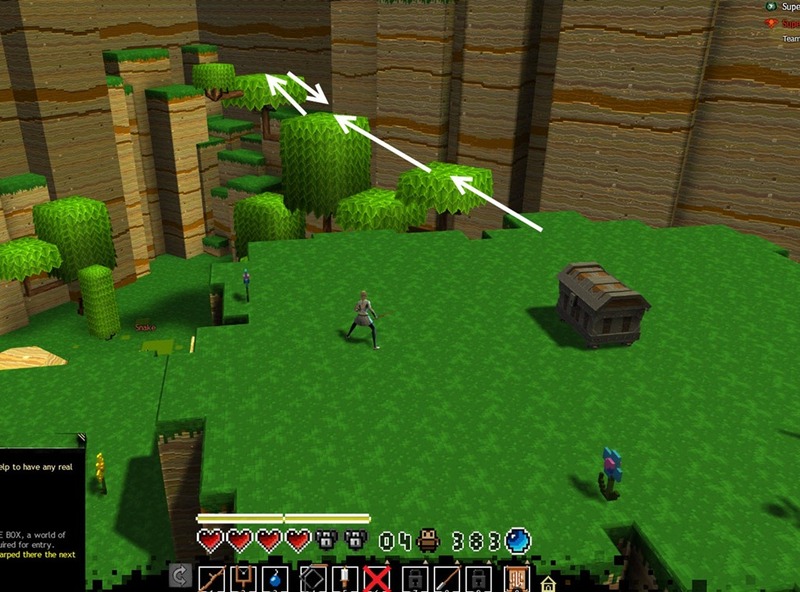 In Zone 1, between checkpoints 1 and 2, there is plateau with a chest atop it. From this plateau, you can jump to the nearby tree, climb to the top, and jump onto a nearby rocky outcropping. At the end of this outcropping there is a spot you can dig for 2 red baubles (+20 each). Don’t have a screenshot to share, unfortunately. There’s another spot on the same platform seen in the second screenshot of the 5th place of World 1 Zone 2. See the top right corner? 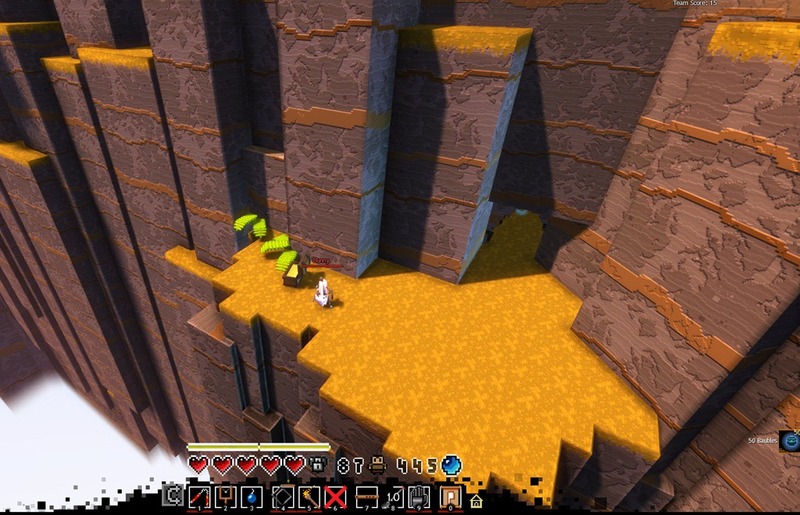 There’s a small nook (or whatever) where you can dig up two +10 baubles. Please delete this. I thought my comment didn’t come through at first. 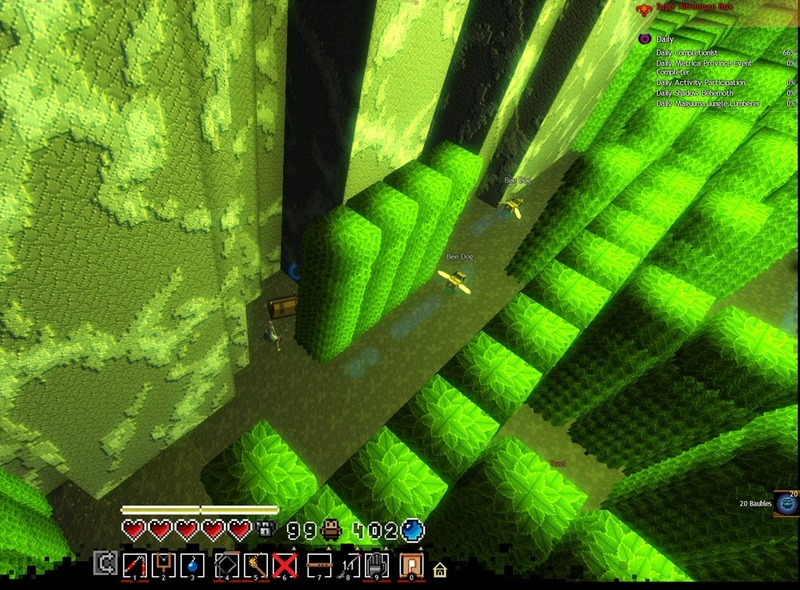 Here is an album of where there are 50 baubles at the end of the World 1 Zone 3 maze to the Queenbee. My bad just noticed it was found by phor 😉 Getting late…sorry. Doh, spent too much time trying to make this look pretty. 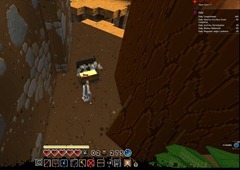 Though there are actually two spots in the World 1 Zone 1 after the first checkpoint to dig for baubels. The first was posted here showing the two 20 baubel orbs, and there’s actually another spot with three 10 baubel orbs. That’s a 70 baubel value at the start! Or digspot is tricky to find. I can’t dig it up. It is a tricky dig. I went there once before and got nothing after trying it for ages to dig in that location. I went back in to check on it again and got the bauble out the first dig. The last picture for #6 in zone 2 is where the dig location is (it was #4 but I added two new spots so it bumped it to #6). I just stood there and dug to pop the bauble. It actually is a tricky dig to get, it’s not like the other ones where you can generally dig in it’s vicinity and they’ll pop out. I’ve found two spots where they’ll produce the orbs. …how did I misread that. I really need some sleep D: Feel free to delete Dulfy! 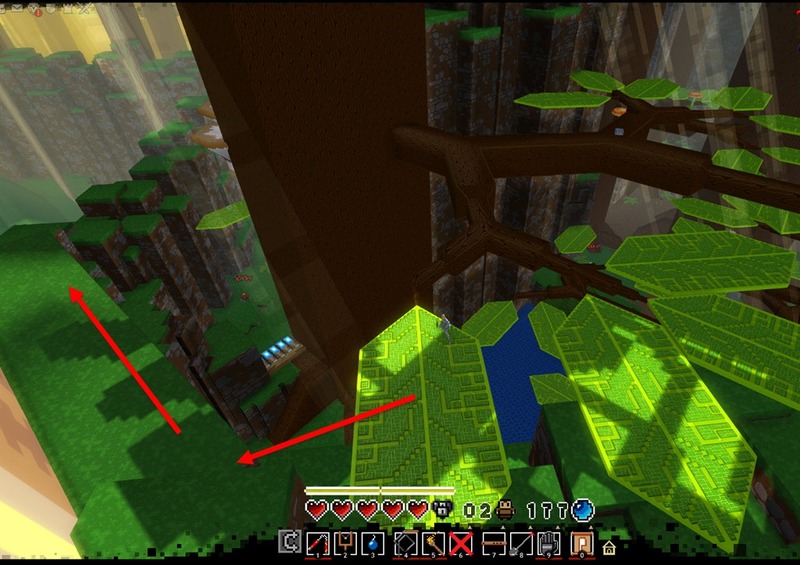 There are a couple more digspots in the area with the horizontal trunk in World 1 Zone 2. 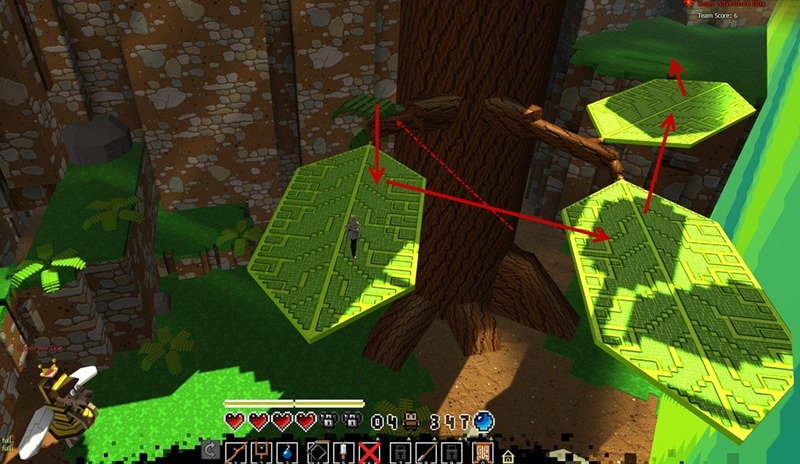 One is near said trunk (2×10 + 2×5), the other is in front of the shop (5×5). Here’s a shortcut to the last dig orb in World 2 Zone 1, just make sure you fall within that little space. 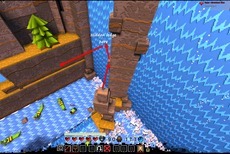 There is also secret room behind waterfall with 1×10 and 5×1 baubles but that is not a dig. 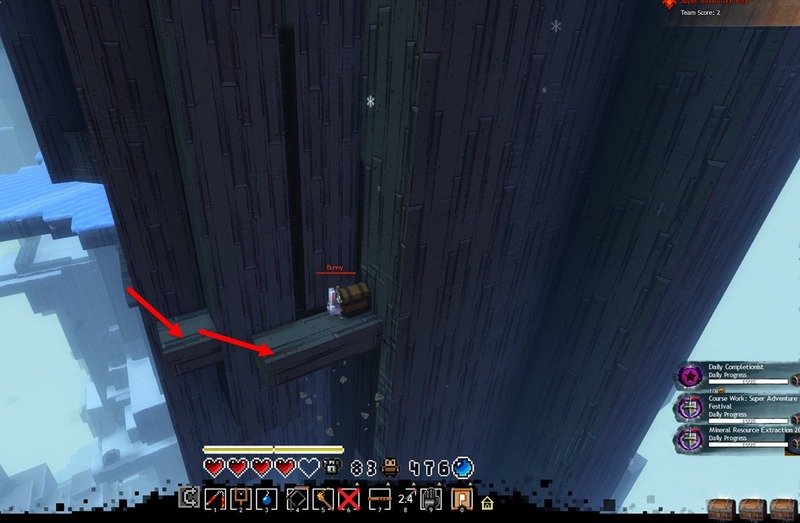 Found another chest for all to enjoy, it is above where the worm short cut starts. Enjoy! Ehrr never mind. Thought I was looking at another article, not the digging locations one, sorry ><. 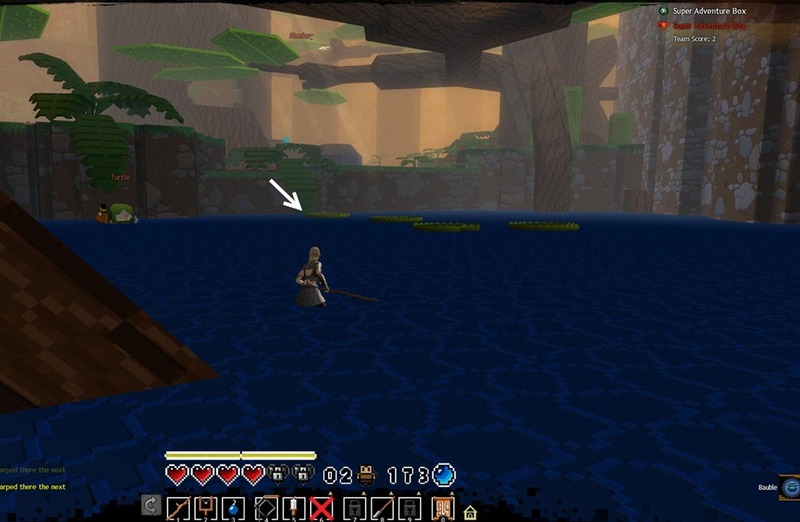 What/where is the shortcut wurm in World 1 Zone 2? Nevermind. I found it after reading another guide. 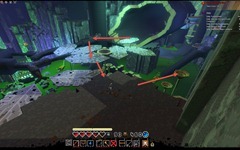 Supposedly there is more baubles .that are missing from this list according to this person: https://forum-en.guildwars2.com/forum/livingworld/sab/Super-Adventure-Time-Secret-Purple-Bauble/1777798. His list is inconsistent with the finds located here. Even though he claims that the SAB team has taken out almost all the bauble he had found, it still doesn’t match up to the finds or total finds that he has and what dulfy has. 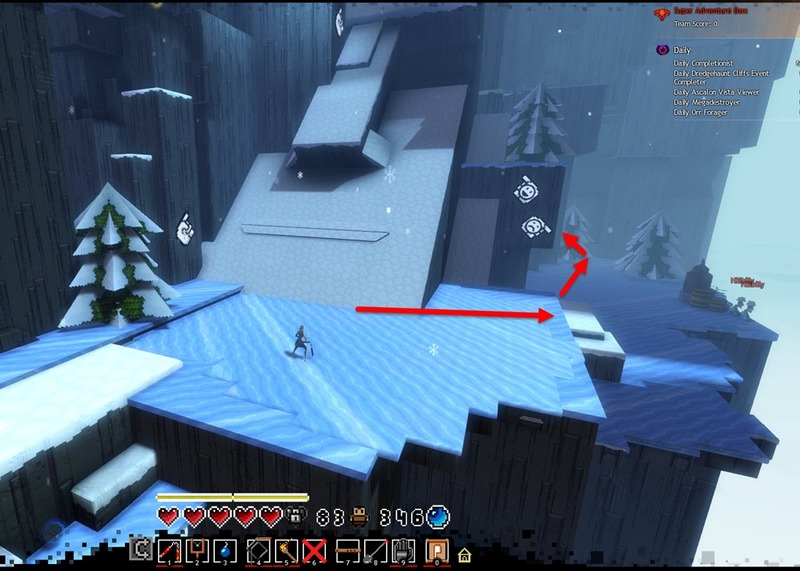 1) From the starting area if you go straight and then right (Where the bottom jump pad falls). You then follow the river north to the waterfall. 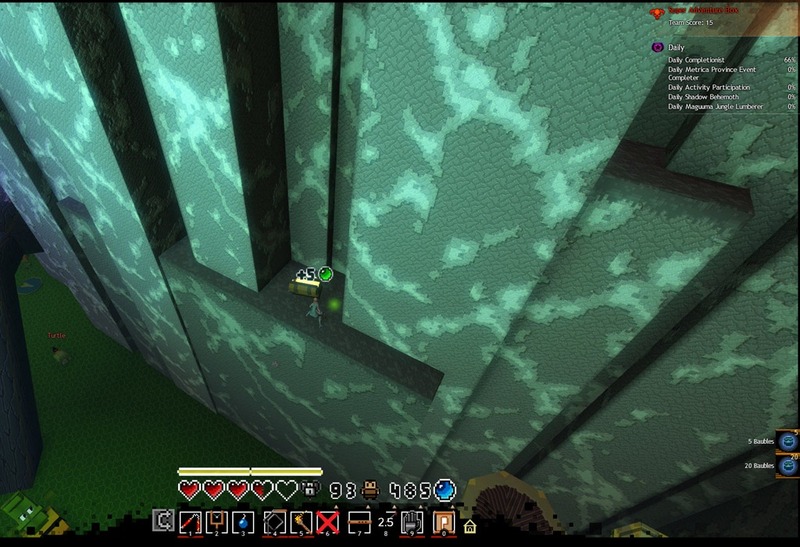 You then just jump around corner into room behind the waterfall. If I recall it was 25 baubles. 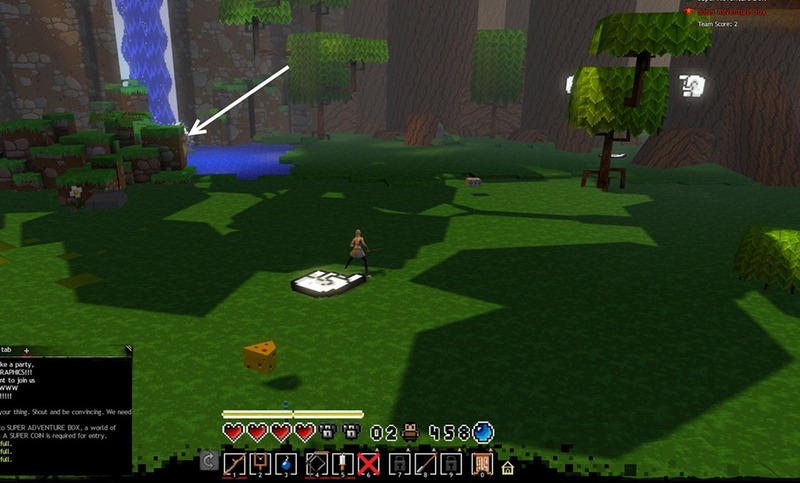 2) Same location as mentioned by Chiara, but on the ground floor you can walk into the waterfall. Unless I missed something in this jumping room it was too much effort for the 5 baubles. But neither of them are digging locations. 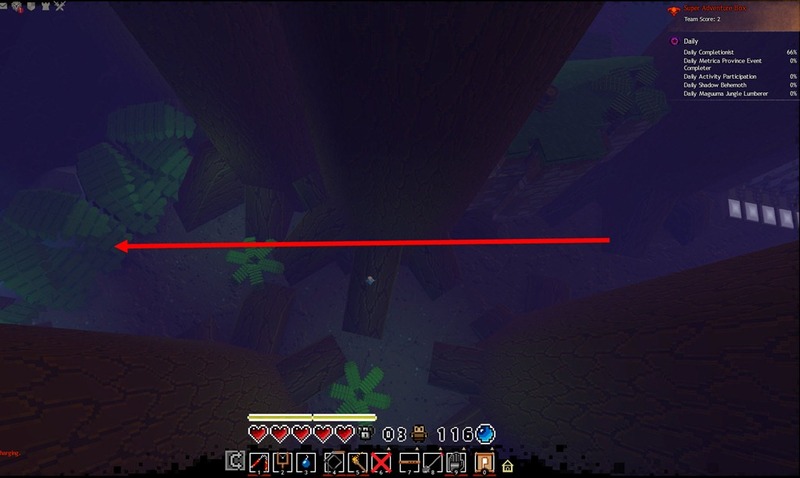 2 new dig spots I found in World 1 Zone 3. 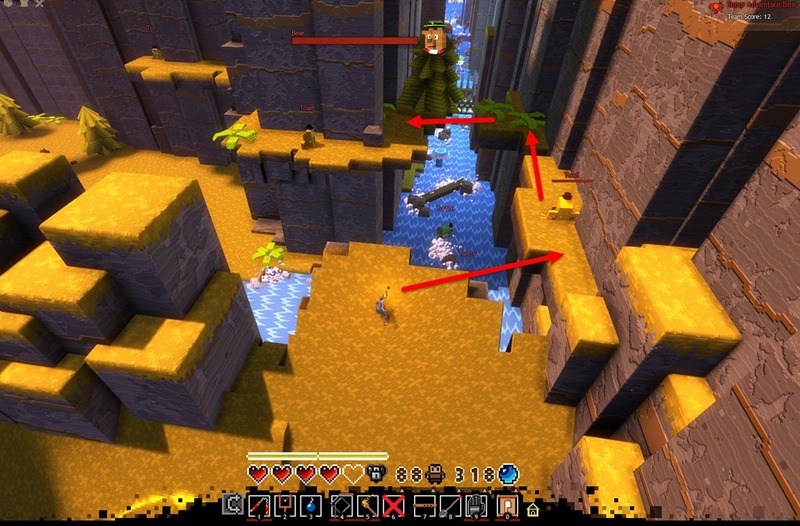 Both of these spots are located before and after the last checkpoint of the frog boss. One gives 25 baubles, the other gives 50. World 1 Zone 3, before the checkpoint of the Frog Boss. 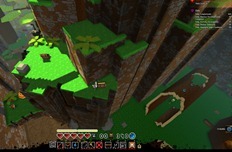 Must use the top checkpoint with the the falling leaves to get up here easily, 25 baubles. World 1 Zone 3, this is after the checkpoint of the Frog Boss. This one is very difficult and frustrating to get. The only way to get up there is to use the checkpoint launch. After that it involves a lot of tricky jumps and wall hugging. 50 baubles. +1, this is still an available dig spot today. Zone 2 Point 1 and Point 2 , Instead of 40 baubles, it’s now been changed to 5 baubles. Point 3 is now 20 baubles instead of 25. Point 4 is now 20 instead of 25. Point 5 is now 20 instead of 50. Point 6 is now 50 instead of 35. Point 7 is now 20 instead of 50.
how many times do you have to dig at these spots for those baubles to pop? i’m starting to think i got a bunny curse cuz i killed so many bunnies a tornado of bunnies appeared and a mass of bunnies came to take vengeance. now i get a lot of bunnies when digging. 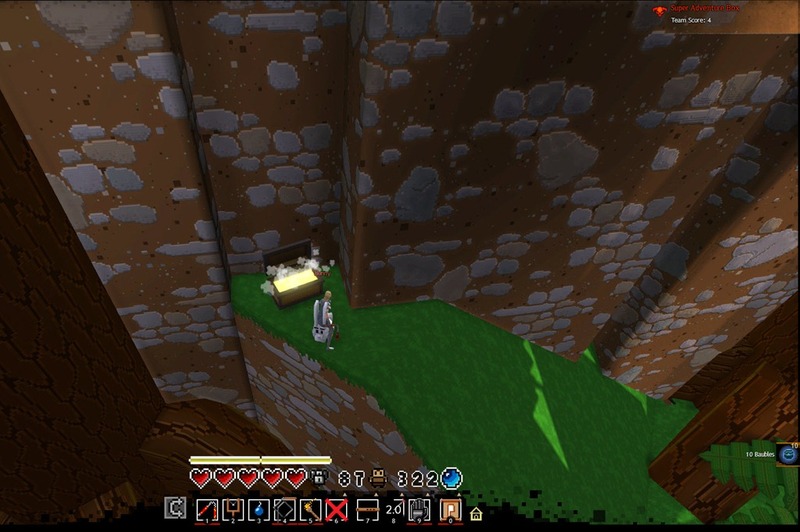 I don’t get any baubles from the first digging spot in W2 Z1. those digging spots does not work any more? Dug 5 times in word 1 map 2 (first two spots) and didn’t get anything except a bunny. W1 Z2 – all spots are giving now less bubbles. 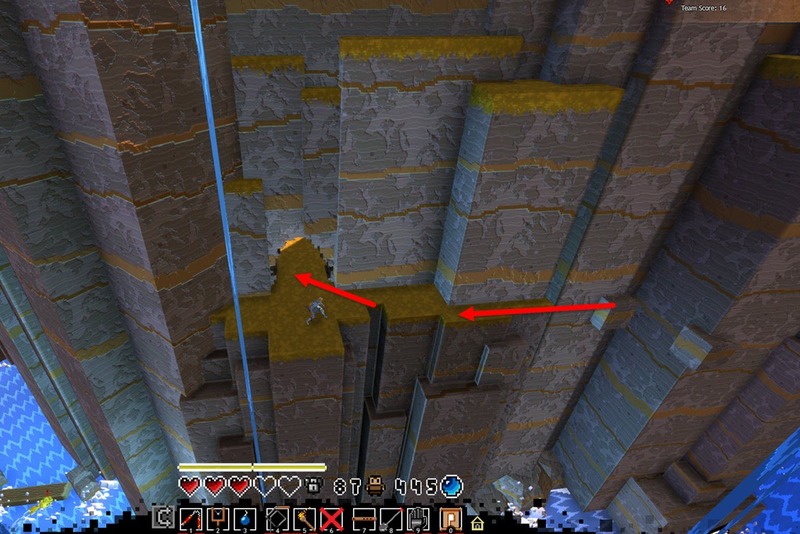 Found 3 new digging spots in World 2 Zone 1. Sorry for the long post. 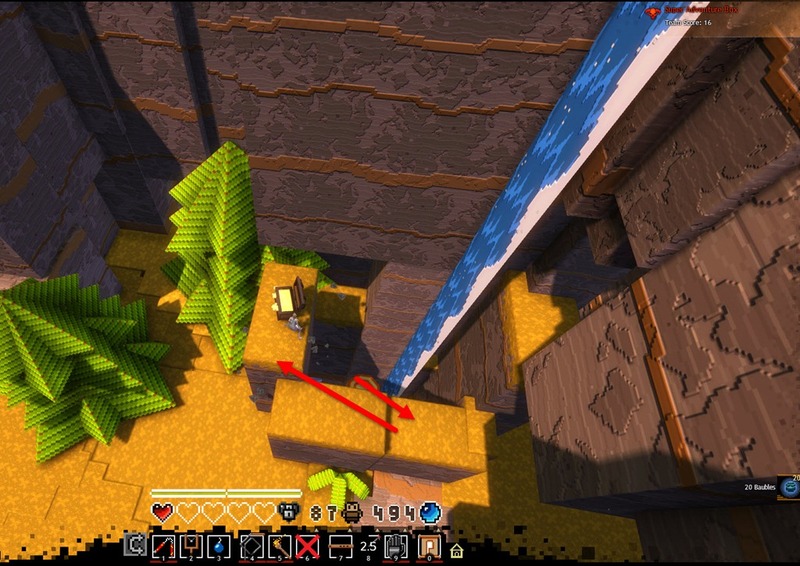 The jump can be a bit tricky, but try to get the current to carry you to the piece of land sticking out. The starting point to these pictures is near the first set of hillbillies around the area of the raccoon/mae entrance. Taking the bouncy mushrooms all the way up will get you back to the top of the cliff you descended from. As soon as you enter, i suggest you do as the image above shows, they can’t hit you on the rock and it lets you catch your breath. 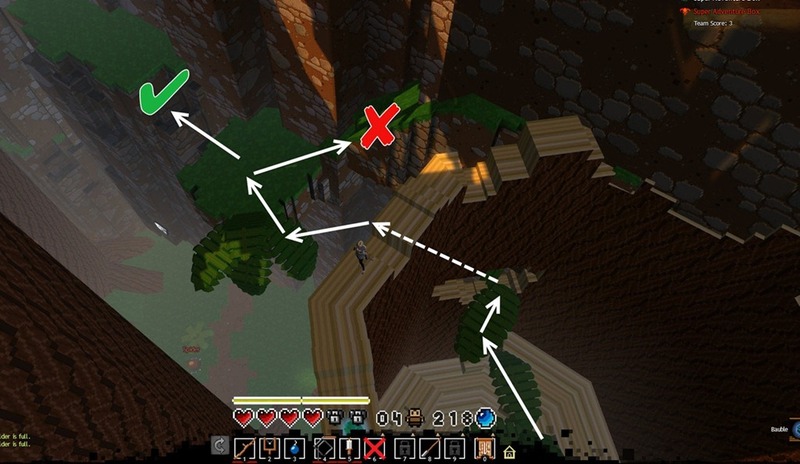 Take the path to the right of my character’s current direction and keep to the left side of the cave. After you leave you will be face to face with an angry bear, kill him and dig where he was originally standing. You can then burn the trees to continue on with the zone. I read a dev post that said that if you play on easy mode, the dig spots don’t work. It might be worth mentioning at the top that you need to do this on normal or harder. That explains why they didnt work! There is either a bug or the first spot in W2Z1 no longer works. No I am not in infantile mode. So, um, yeah, the sites for two and three in W2Z1 also do not seem to work. A lot of these dig sites have had the number of baubles they give out reduced. They still work (except in Infantile Mode). Found some new spots in W1Z1. This is before the first checkpoint. Found some spots for digging W1Z1. All gives +1 bauble. 1.This is just before the first checkpoint. 2.This is just after the first checkpoint. 3.There are two baubles near the one mentioned above. Oh my god, I don´ t know why but my post get send not 1x but 3x 🙁 Sorry Dulfy! I´v already reported it. I only got a chest on the first waterfall before the 1st check point and it gave me 5 baubles. No 2 red baubles after digging on the rock. Am I doing something wrong? 1. Dig sites can only be looted once per account per day now. 2. Dig sites do not work in Infantile Mode. 3. Most dig sites have had their bauble reward changed to a flat 20 baubles, although I have seen lower amounts in some cases. I have had a bug before where the dig sites would not work even in Normal mode, but when I got to the end of the stage, I got a Baby Mode achievement, so it was wrongly thinking I was in Infantile Mode. I think this may have happened because I’d talked to the Infantile cloud first before talking to the normal NPC. Thank you for this. At least this is how it’s working for me as well currently. Some have also been increased as high as to 50. 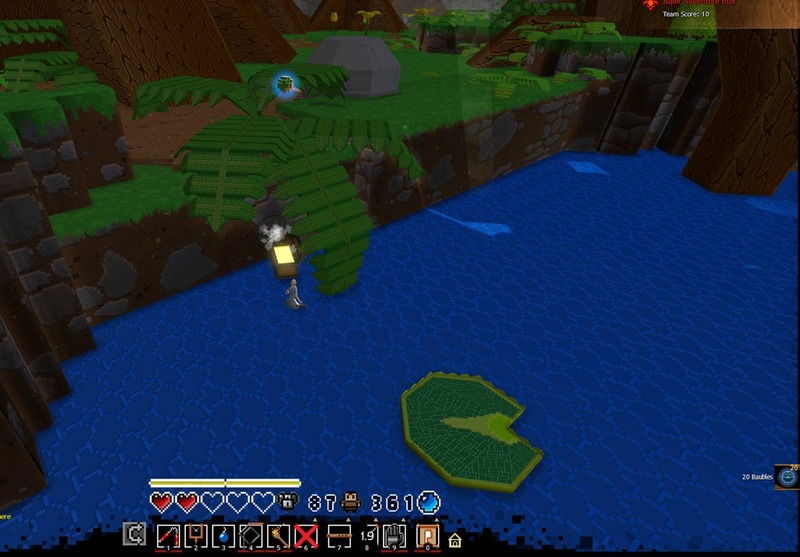 The dig spots in World 2 Zone 1 also seem to have changed as I have been unable to get any of them to work. Overall, this guide is pretty outdated, but it still works well for World 1. 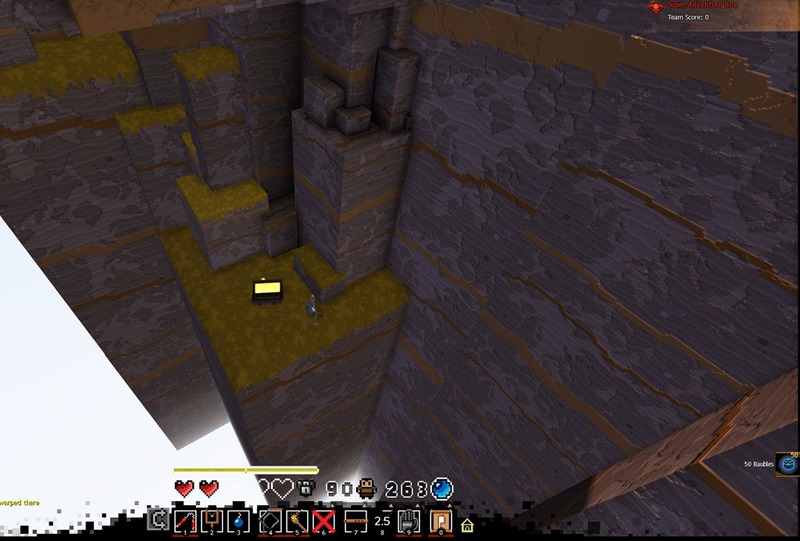 None of the dig spots in W2Z1 work (1st time doing it in normal mode) I’m getting nothing from them. W2Z1: First 3 spots don’t work. Someone below has posted a few more dig sites for W2Z1 that DO work, however. You can find 2 dig spots in World 2 Zone 1, after the rift drife, when junping over the large rift under the pushing-foreward-flower there’s a second one, jump into the waterfall there and follow the path, one position is above the bear (near the burnable trees, gives 50 bubbles) and the second one above the next checkpoint. 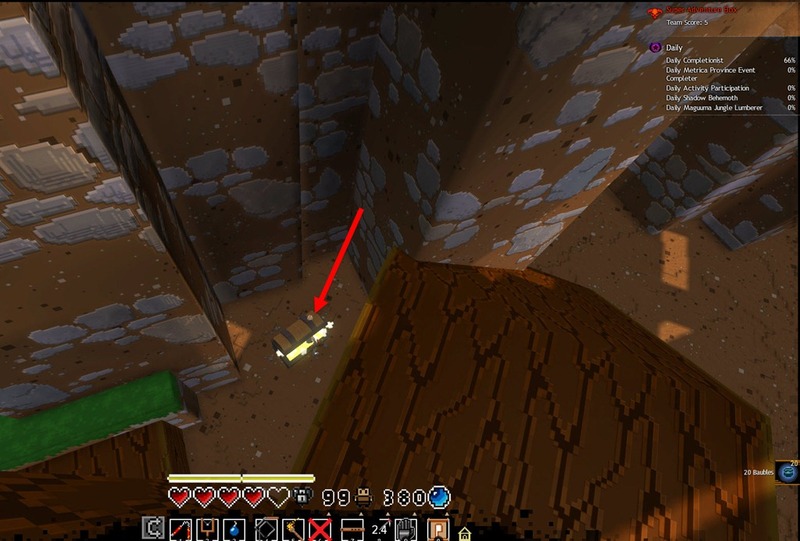 Found a dig spot in the first hidden room in World 2 zone 1 behind the waterfall. 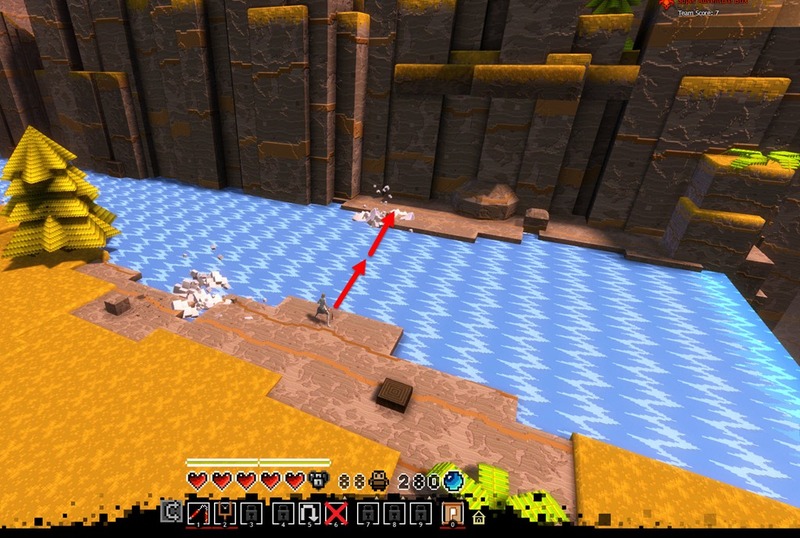 Run across the water to the platform where you begin the spout jumping. On the left hand side octagon rock is where it is. 20 Baubles chest, which makes this room a 40 bauble room altogether. And another. This is after the first checkpoint and after the first row of alligators and turtles. 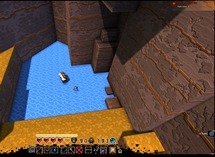 after you cross the first river turn left and jump up the walls to the waterfall. 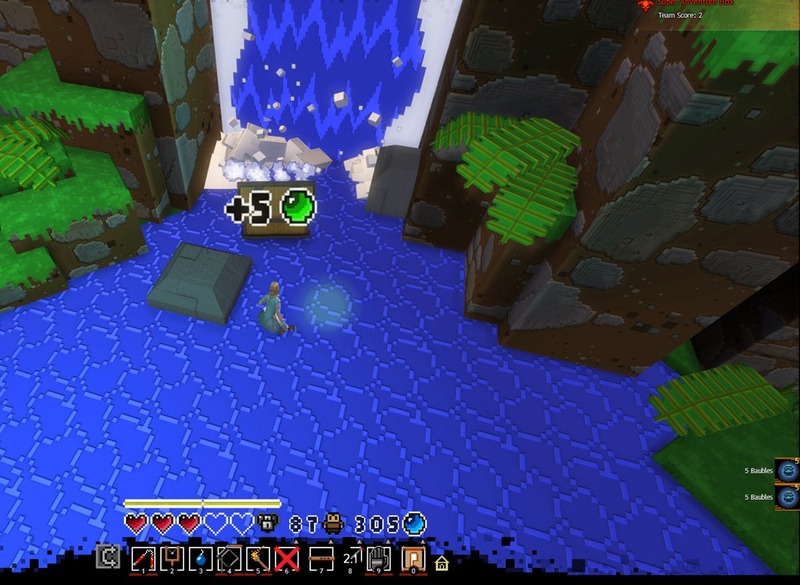 You can jump into the waterfall onto a ledge inside it. Run down the ledge and jump out onto the platform on the other side of the river. This may require a mid air left turn while jumping. From there you jump across a small river that branches left from the second main river. You can jump down to the ground from the platform across the small river and run along the ground there till you reach a second tall pillar of platforms. You will want to jump up this and then jump across the small river again towards the fern and pine tree. This may require a flip or dodge+jump to cross. There is a waterfall and small pool of water behind here. Dig in the center of the pool for a 20 bauble chest. Here is part 1 of visual guide. and part 2 of visual guide for second dig spot in W2Z1. Here are screens of what Adabas was describing. The one above the bear is a 50 bauble chest and the one above the checkpoint is a 20 bauble chest. Follow Dulfy’s guide to the secret room under the waterfall and 1st chest and you will be in the right place to reach both of these. the 2nd of the 4 bears thru there will always drop a key on normal mode making this a 95 bauble area (there is a 5 bauble in front of the key chest). Follow Dulfy’s Associate of Baubles and Secrets guide to secret room #2 between checkpoint 7-8. 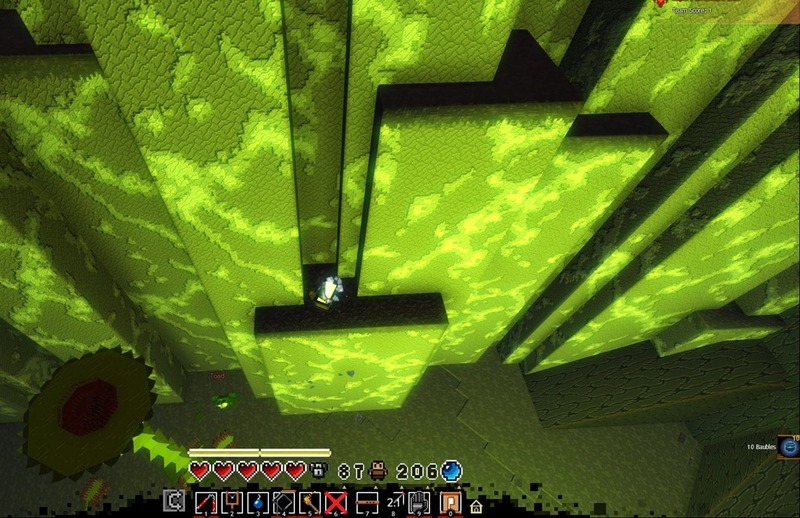 When in the secret room dig underneath the green 5 bauble and you will uncover a 50 bauble chest. 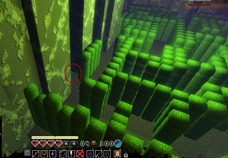 In the Raccoon Kingpin maze in the same area there is a 20 bauble chest. To get there hug the right side of the maze and turn the corner where the frog is. Past the buff barrel is the dig location. 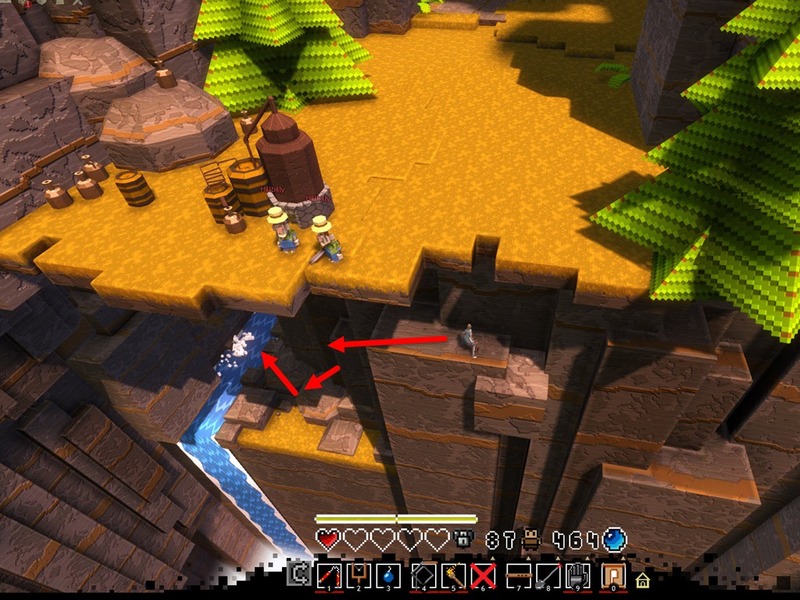 When you reach the descending logs area, there is a room inside the waterfall before the spot where you use a bomb to open the hidden store. 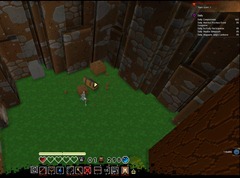 In the seemingly empty room there is a 50 bauble chest – dig right in the center. It is just above the bottom teleporter, so you can use that as your jumping cue and also safely exit the room by jumping straight forward on the left side of the opening. And that is all I could find for World 2 Zone 1. =) The result of the run is about 230 baubles from 7 dig spots. Plus one 20 bauble, two 5 baubles, and one 20 bauble Key Chest. This is also not counting what you can get from killing the bears along the way which usually drop 10 count baubles. Thanks for all your research, Risa! 🙂 I loathe Rapids due to my generally high latency, but all of these dig locations is at least making it tempting. If you happen to go bauble hunting for Z2/3 in World 2 as well, I’d love to know your findings! You’re very welcome. I’m gonna work on W2Z2 today and I’ll do W2Z3 tomorrow. Lets see if I can condense them into fewer posts this time around now that I have a good idea of what I’m doing =) Happy hunting! The first dig sport is before the first checkpoint. 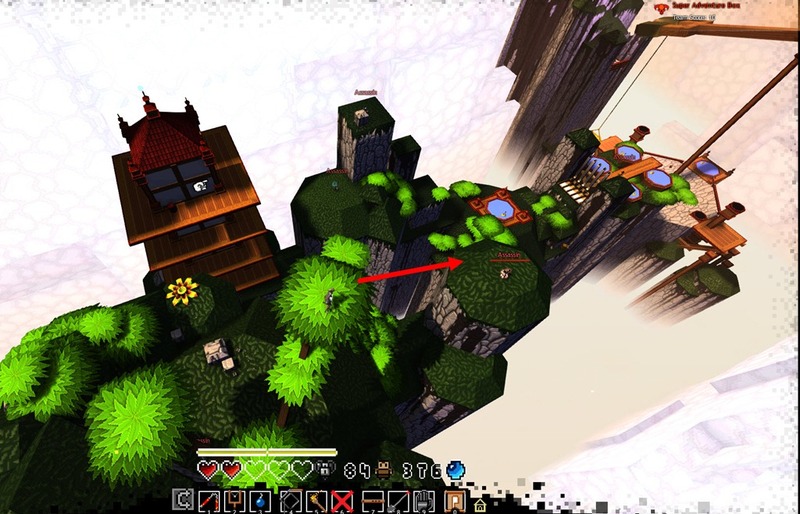 Use the first Spinning Flower you come to, hop across the clouds to the first pillar/cliffside. 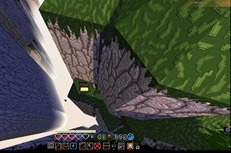 Next quickly jump across the disintegrating cloud to the next pillar/cliffside. 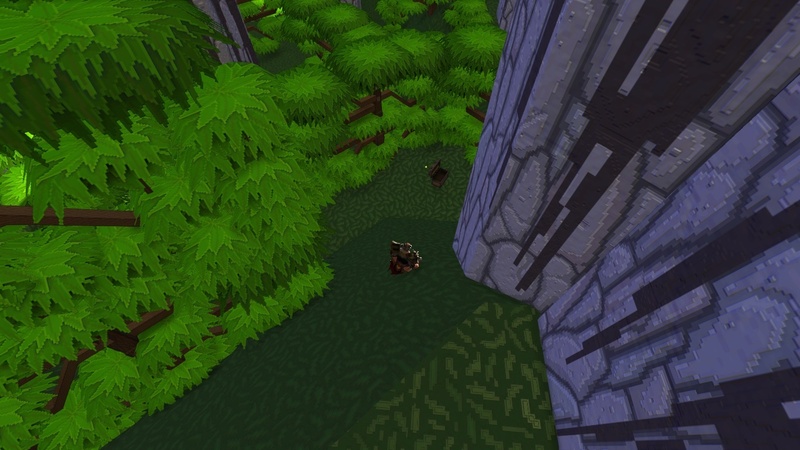 Here run around to the other side of the pillar/cliffside and drop down into a shady little nook. 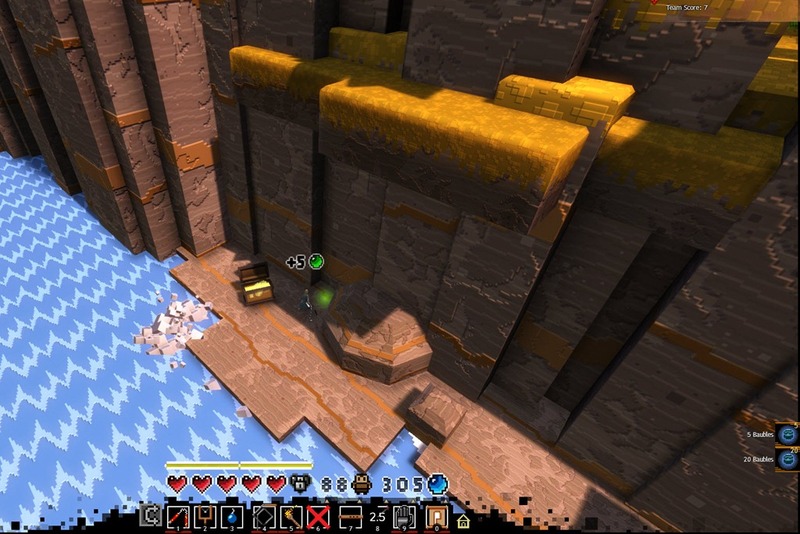 dig here for a 50 Bauble Chest. The second dig site is near the second pagoda in the zone, the one with the chest on the top floor (which you can get a key for from one of the 3 or so Assassins around the spot). 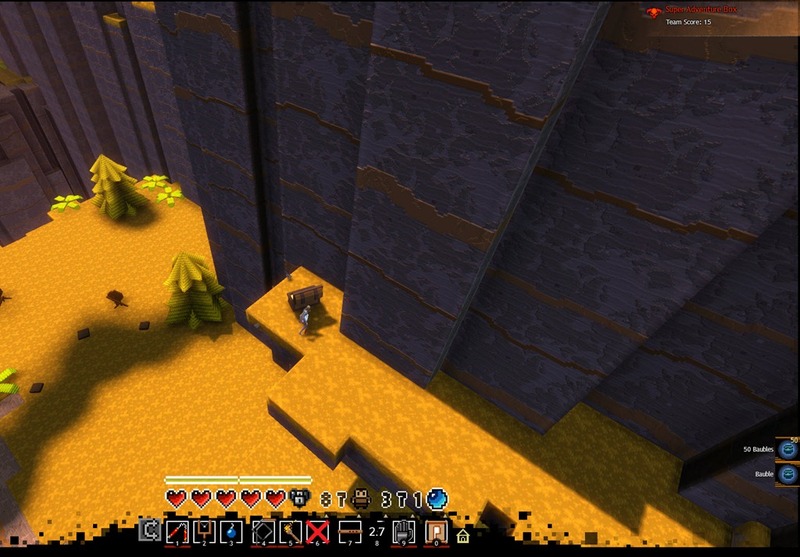 You will want to hop along the right edge of the pillar/cliffside where a red exploding barrel is. Hit that before you touch it of course. Past that you will hop up to the area where there are as mentioned about 3 or so Assassins. Clear them out and work your way up the tree there. 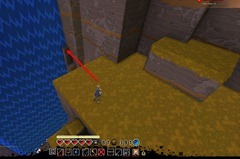 Jump from the tree towards the Assassin who is by himself on his own pillar/cliff. 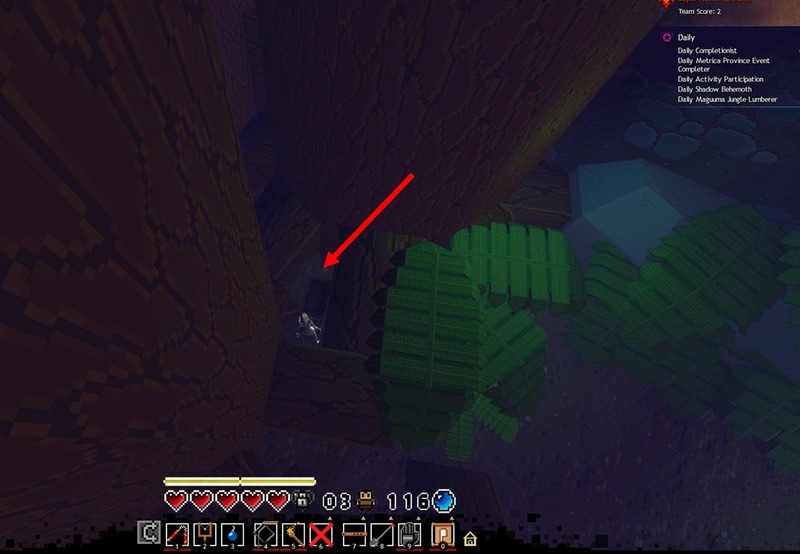 After killing him you can dig where he was standing for a 20 Bauble Chest. 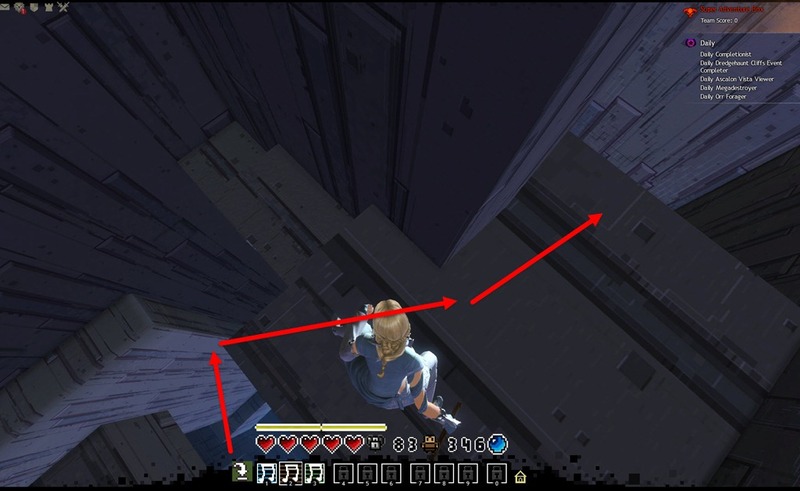 The third digsite is right after Checkpoint 6 in Hidden Room #4, which you must access by going thru Hidden Room #3 (See Dulfy’s Bachelor of Secrets W2 guide). 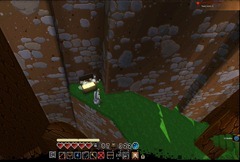 Simpy hop thru the hole you make to reach room #4 and dig where you land for a 50 Bauble Chest. The fourth digsite is on your way to Hidden Room #9 where you learn the 332331 (opening doors) song. 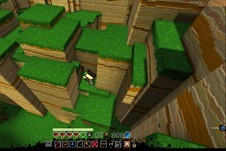 Before you enter the maze head over to the Hillbillies, knock them out, and hop to a ledge to the left of them and dig there for a 20 Bauble Chest. The fifth digsite is at the last checkpoint of the zone. 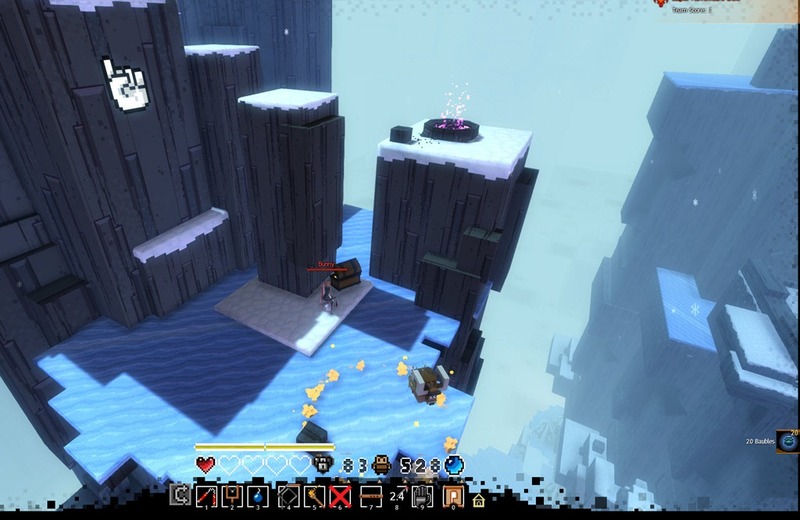 After activating the checkpoint but before proceeding to the boss, carefully make your way to under the bridge and dig there for a 20 Bauble Chest. That is all. Happy hunting! Tomorrow I will search out W2Z3 and post what I find. Today was W2Z3 as promised. Here is what I found: 4 Key chests, 3 50 Baubles, 3+ hidden 10 Baubles, 8 Dig Spots which result in over 390 baubles (I don’t know how many the first dig spot gives because my camera cut off the overhead icon). 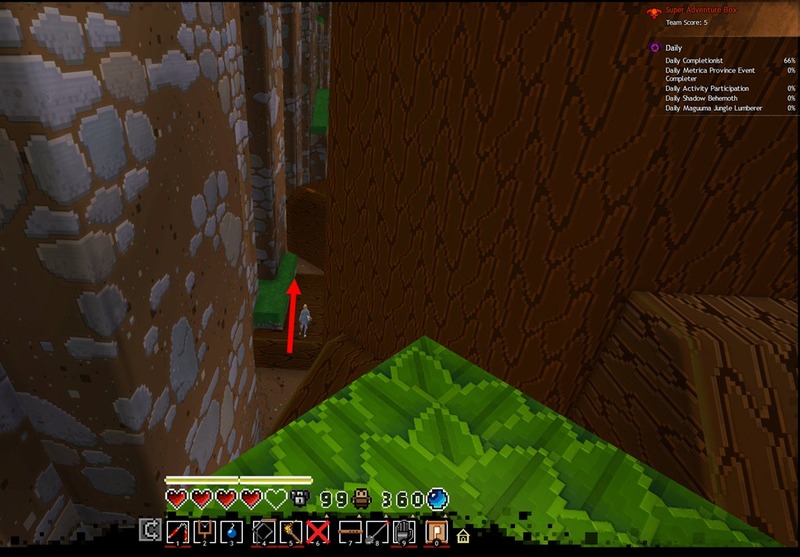 Dig Spot #1: On your way to Hidden Room #1. Turn Left after you drop down the tunnel instead of Right. Make your way as far back into the nook as you can and dig. Dig Spot #2: This is a ways further in by the first ‘gauntlet’ of blowing wind with Explosive Barrels at the end. It’s actually above the 1st Shop in the zone where you start play. 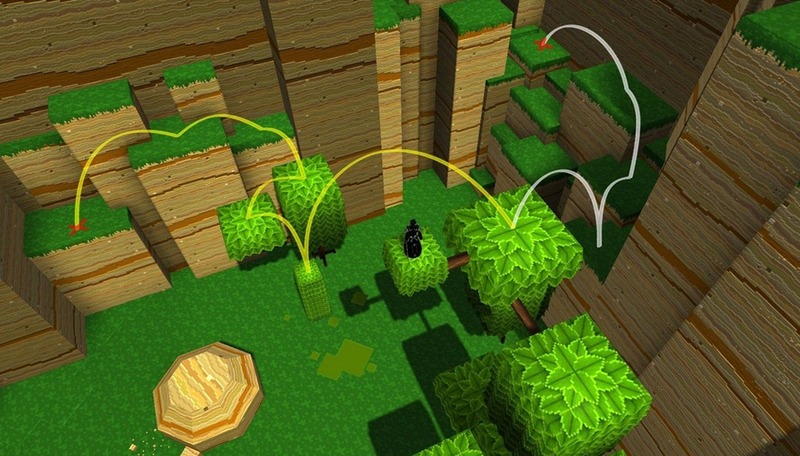 After you jump to the first blue bauble you see on the windy path you will want to hop over to the square that sticks out from the platform a bit. From there you can see the 1st shop and a blue bauble hidden under that windy platform. Jump down there to the blue bauble and angle your camera downwards. You’ll notice 2 doors with the Push symbol on them. Jump to the Left and you will find a hidden 10 bauble. 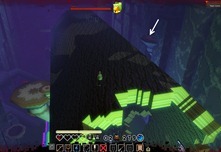 Jump to the right and dig in the center of the room and you will find a 50 Bauble Chest. 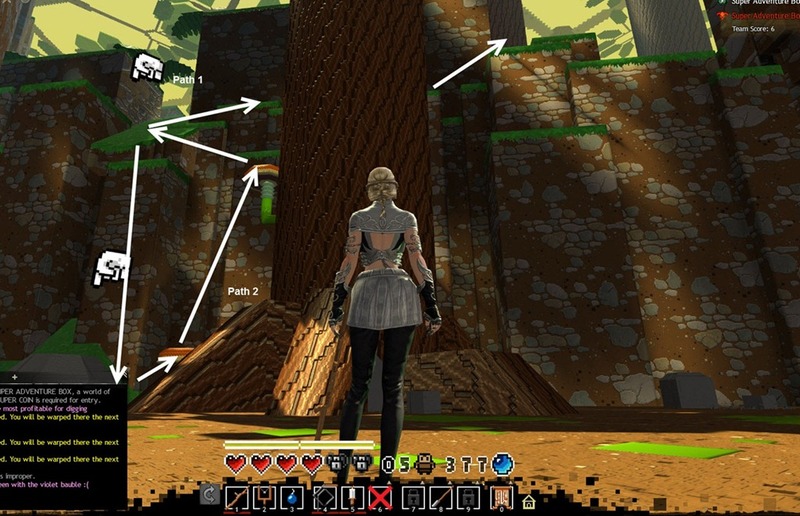 You can push open another door from here and see the Raccoon Kingpin’s Stump to your right. Both jumps exclude the other so if you want the bauble and the dig spot you’ll need to make 2 trips, but it doesn’t take long to get there. Dog Spot #3: This is almost immediately after Checkpoint #2. 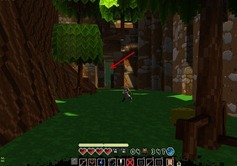 Drop down the tunnel as indicated by the down pointing hand. Turn left at the bottom and make 3 jumps across a ledge and 2 small platforms. 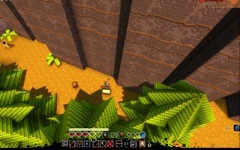 On the rectangular platform is where you want to dig for a 20 Bauble Chest. Dig Spot #4: This is right after Dig Spot #3. 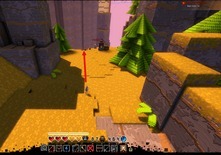 You will set up and use the Teleporter that sends you to the first cliffs of Jumping Goats. 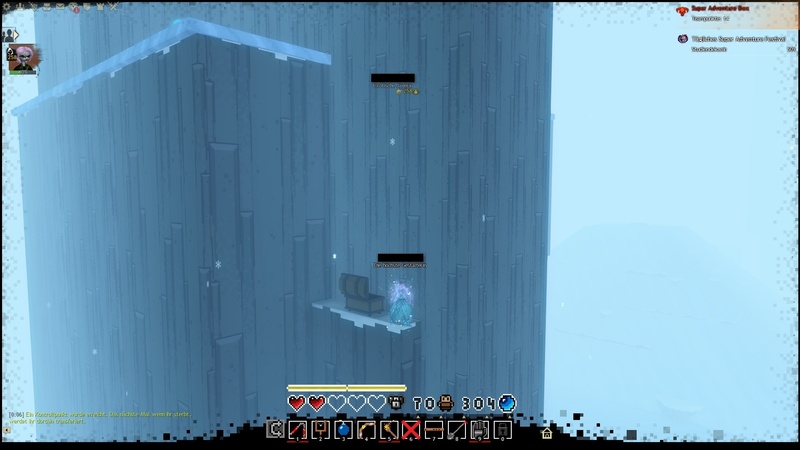 After you pop over there, jump down and dig in the square patch of snow for a 20 Bauble Chest. Dig Spot #5: Also nearby. Hop back up to the Teleporter where you can see another Teleporter. 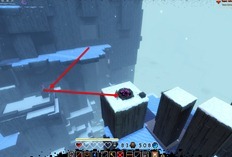 Use the second Teleporter to be sent to another platform which has an Ice Wall you can melt with the Torch. This part is the same as if you were setting up the shortcut as shown in Dulfy’s Master of Secrets guide, except instead of running to the pushable block right away you will hop off the platform to the lower platform where you can open a door using the Flute by playing 332331. 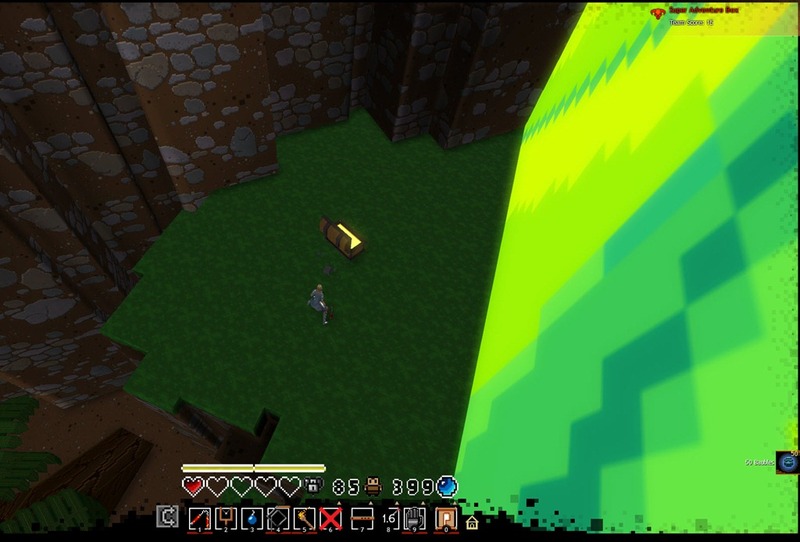 Digging in the center of this room will give you a 20 Bauble Chest. Turn Left after you leave that room and hop onto the ledge. 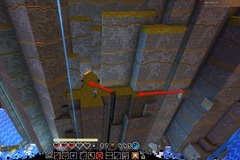 Follow the ledge around till you see another Ice Wall which you can melt with the Torch. Inside you will find a 50 Bauble. 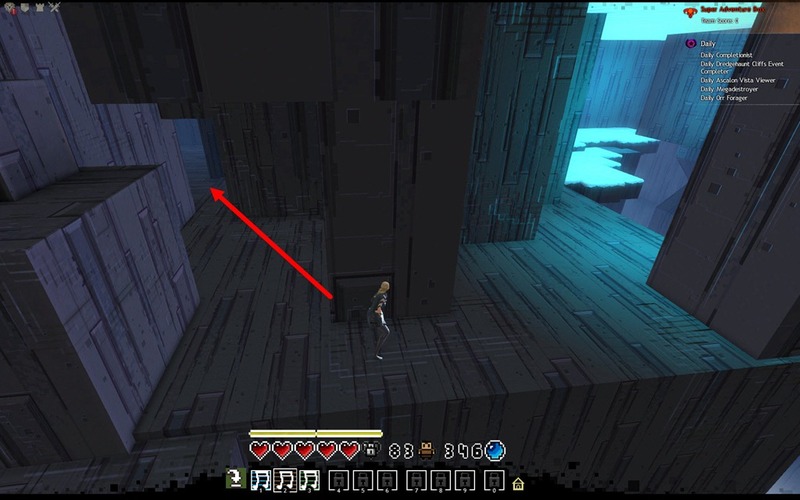 Exiting right away and jumping off the ledge will land you at Hidden Room #8 which again needs to be opened with the Flute playing 332331. In this room is a second 50 Bauble. If you want to hit Hidden Room #8 after Hidden Room #7 instead, you can wait for the Ice Wall to refreeze. 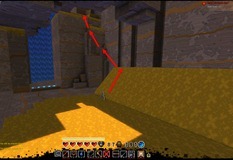 Once it does melt it with the torch again to be teleported back to the ledge where the dig spot was. 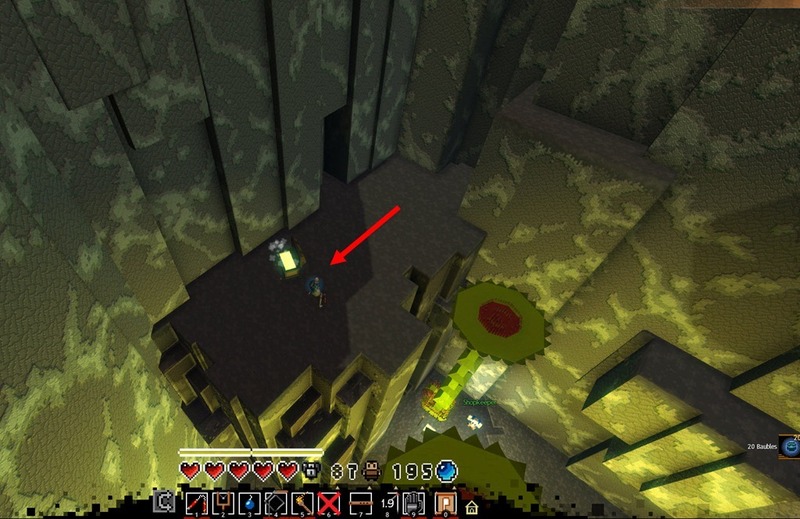 Dig Spot #6: This is reachable on your way to Hidden Room #7 as shown in Dulfy’s guide which has three 10 Baubles inside it. 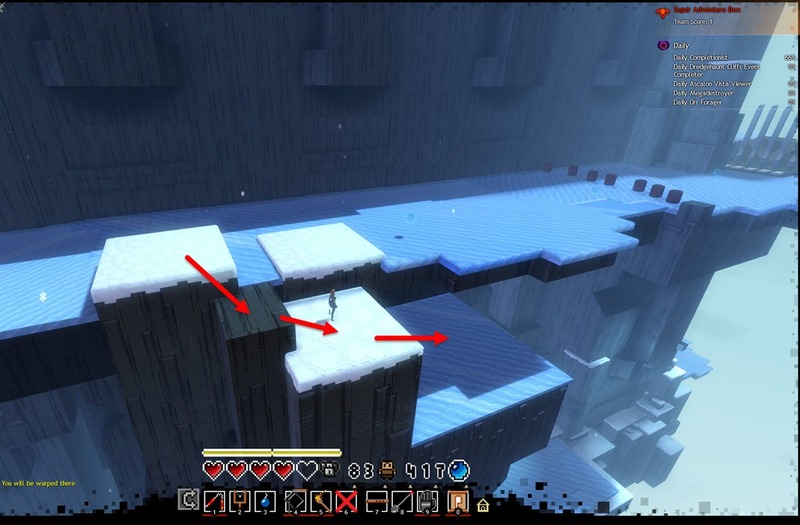 Before you jump all the way down to the hidden room from the platform where there is a Polar Bear, instead look for the pillar that is standing out by itself and jump onto that. Dig on top of that for a 50 Bauble Chest. 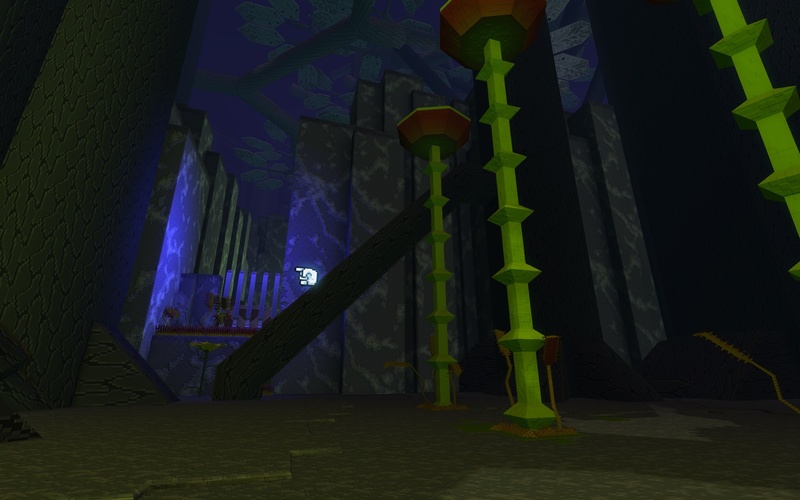 You can jump to Hidden Room #7 from here – again it needs to be opened with the Flute playing 332331. 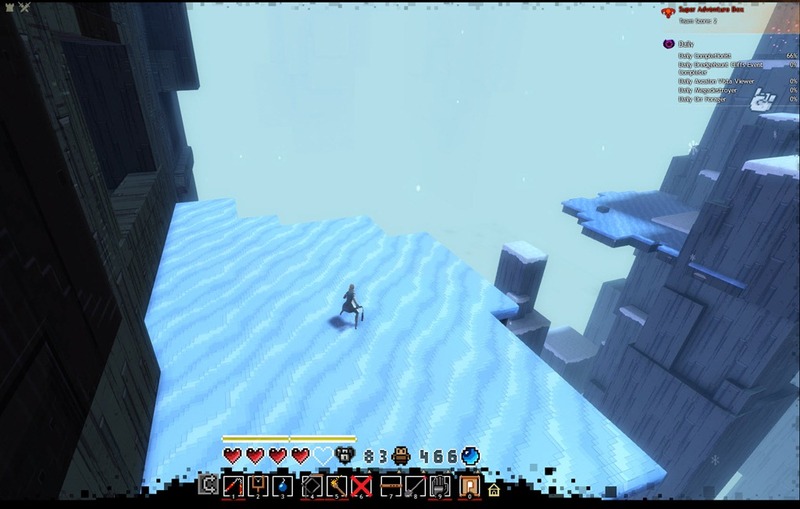 That Polar Bear on the platform will drop a Key if you kill him, which you can use to open a Key Chest containing a 50 Bauble. 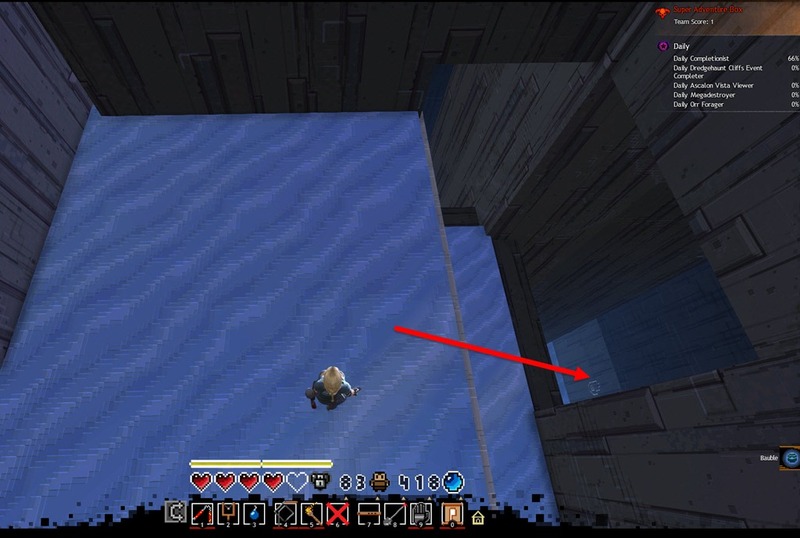 The Key Chest is actually underneath the Polar Bear’s platform. 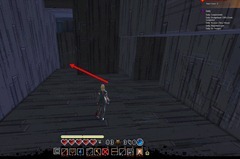 After you kill him walk backwards towards the far edge of the platform till you see an opening. 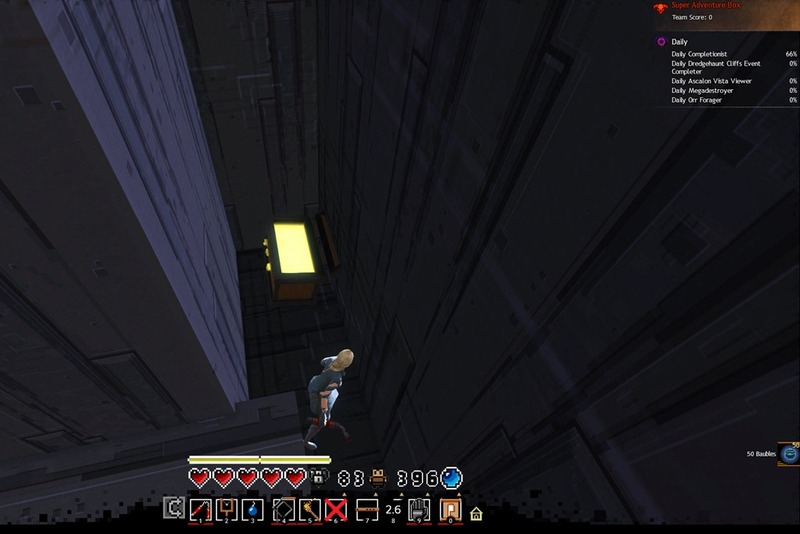 I recommend taking the Key down to Checkpoint #2 and leaving it there before you attempt jumping into the Key Chest room. 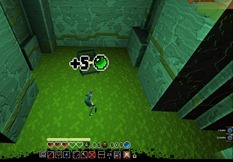 Once you successfully make it into the Key Chest room, you can push open the door and safely collect the Key you left at Checkpoint #2. 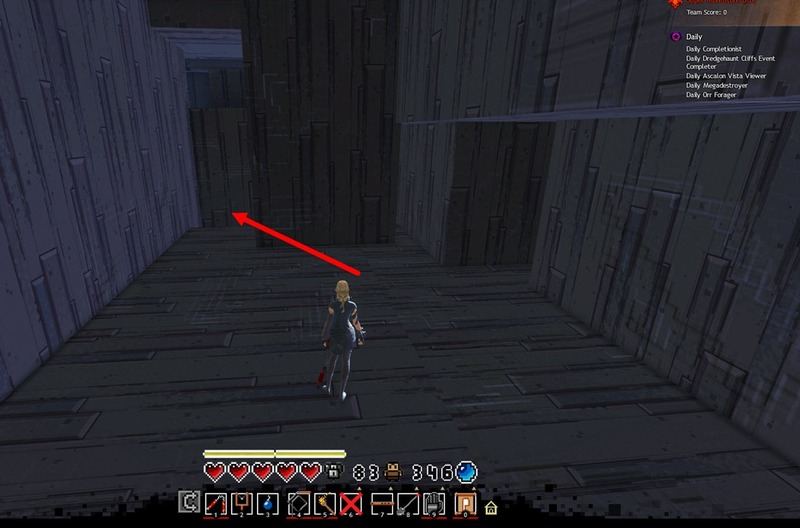 Dig Spot #8: This is in the last ce spikes room just before the boss. From Hidden Room #16, make your way Leftwards to an empty low level platform. Dig at its center to find a 50 Bauble Chest. Key Chest #1 in the zone is just after the Checkpoint #1 and the Key can be found by killing a Banana down near the 10 Bauble you collect on your way to Hidden Room #4. 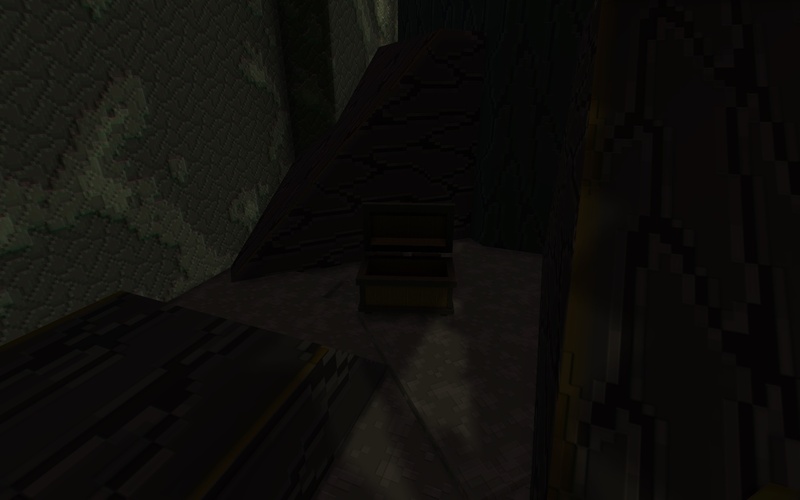 Key Chest #2 is on the way to Hidden Room #7 as detailed above. Key Chest #3 is at Checkpoint #5. The key for Key Chest #3 is acquired quite a ways before you actually get to it, so be careful to not lose it on your way there. 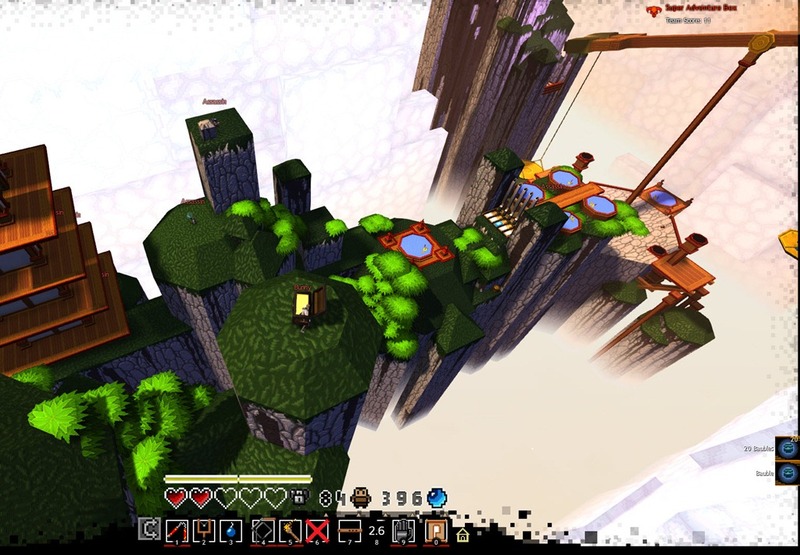 After the checkpoint pops you up into the air, turn Left as you enter the room, it’ll be right there. 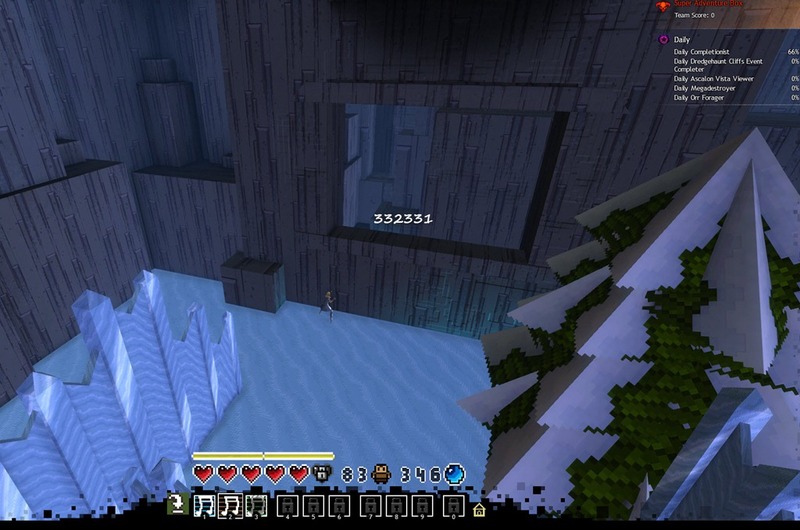 There are also walls you can open with the flute in this area before you drop down to the icy slopes room. 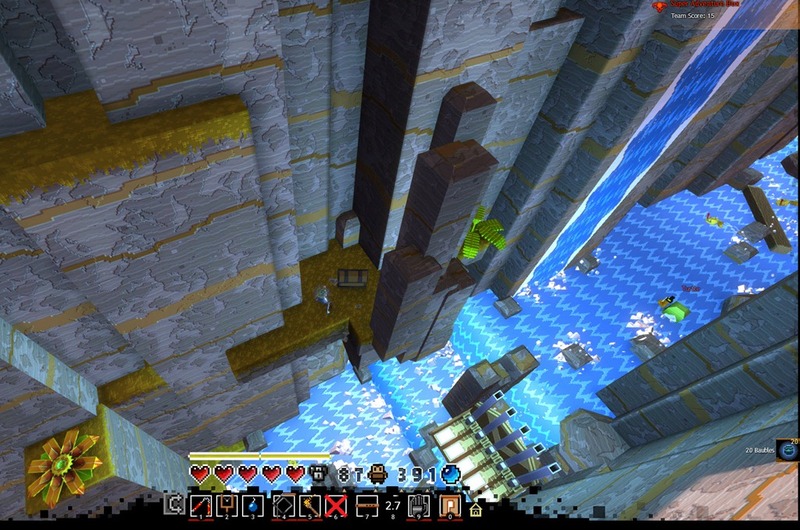 Key Chest #4 is to the right of the bridge to the zone boss. 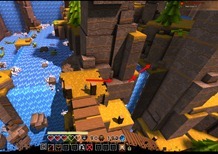 Before you make your daring run across the collapsing windy bridge, rotate your camera to the right and you will see it. I’m not sure where the Key to this chest is… Maybe support will answer my plea for help as I don’t really want to do the Master of Baubles all over again for want of a key. The third 50 Bauble is where you go to get Moto’s Finger. That is all I uncovered for today. I hope these screenshots and directions are easy to follow and grant you all some very good bauble hunting results in all the zones of World 2 =) Good Luck! That resulted in 461+ baubles with all dig spots, 1 key chest, 2 green baubles and 1+ blue. Thanks for all your research, Risa. 🙂 Hopefully dulfy will get around to making an updated version of this page with these guides. You’re welcome. Thank you for letting me know these are being seen. An update to the official post would be most excellent. I saw a lot of requests for an update to the guide and figured the new ‘content updates every 2 weeks’ model must have Dulfy incredibly busy, so I did what I could to help lighten the load. Ah, you are very welcome. I’m elated to hear it was so very useful for you. Thanks! Glad to see you are still playing! Goal is to add them in next couple days. I am just checking all the ones already here to see if the dig spots are still valid and then I will add in the new ones. Thanks for doing so. My rig is in a box atm so these consolidated and updated guides will help me catch up when I am able to unpack it. It’s hard to wait, I’ve missed SAB, one of the most entertaining content options GW2 offers ^_^ so glad it is back! I have added all the W2Z1 locations to the guide, thanks again! none of the spots are working for me.. whats going on? did they update them? Dig spot give nothing in Infantile mode. what a shame that Anerf had to go nerf the digging spots. (meh, it was exptected, thats all they ever do). u wouldnt want ppl to get the sab skins in a decent amount of time, huh? all about that grind, and keeping sab skins pricey. lol 1day in and got 1 skin already, and a lucky box drop, dont really see the problem, just gotta do it in an efficient matter. Gw2 “heres a fun event, now lets make you grind it for anything neat related to it till you hate it”. Someone needs to slap their idiot devs. No one is forcing you to do it. Buy the skins through trading post and move on. Found another digging spot in W1Z2, in the dark forest. Dig under the leaf for 20 baubles. 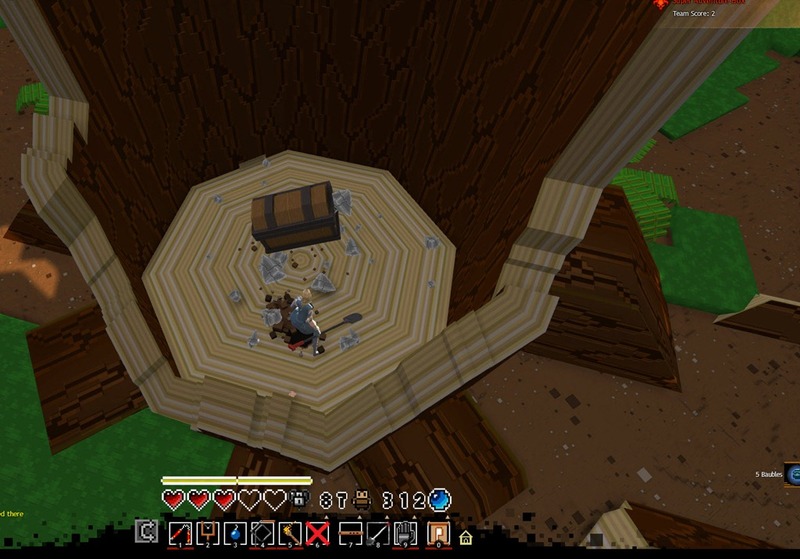 This is W2Z2 chest two and is actually to the left of the trunk at the red arrowhead. 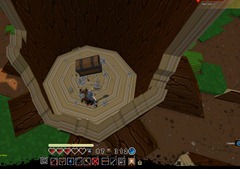 You can dig it from this side of the root, but the emptied chest will spawn on the other side of it. One more in W1Z2, just left from the last checkpoint, I think you need to use the initial launch from securing the checkpoint to get here. My bad, it’s not the last, it’s the next-to-last checkpoint. 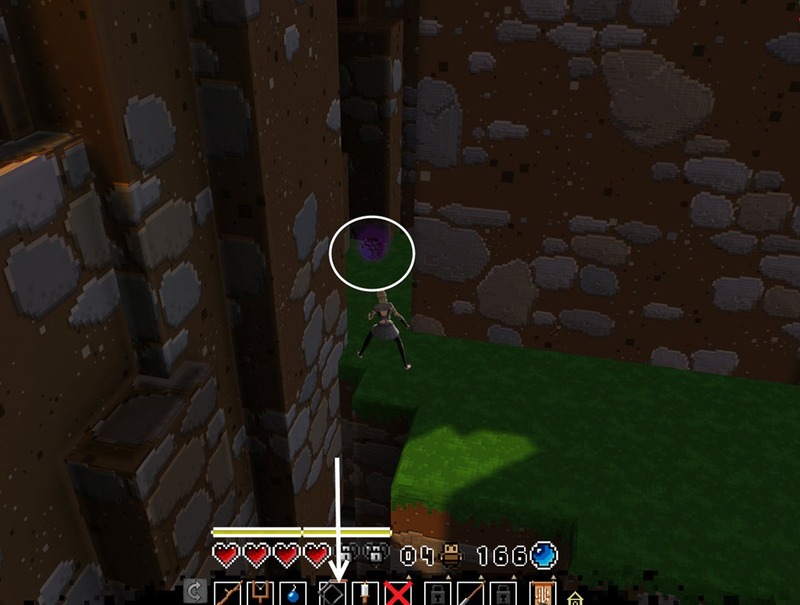 I found a dig location in W2Z3 at the last Bauble if you follow the Bauble W2Z3 guide. Made a little guide how to get there. I made a little guide how to get there. Found another dig location in W2Z2. It’s under the building with the mini-boss assassin, by checkpoint 4. There’s 50 baubles inside the chest. 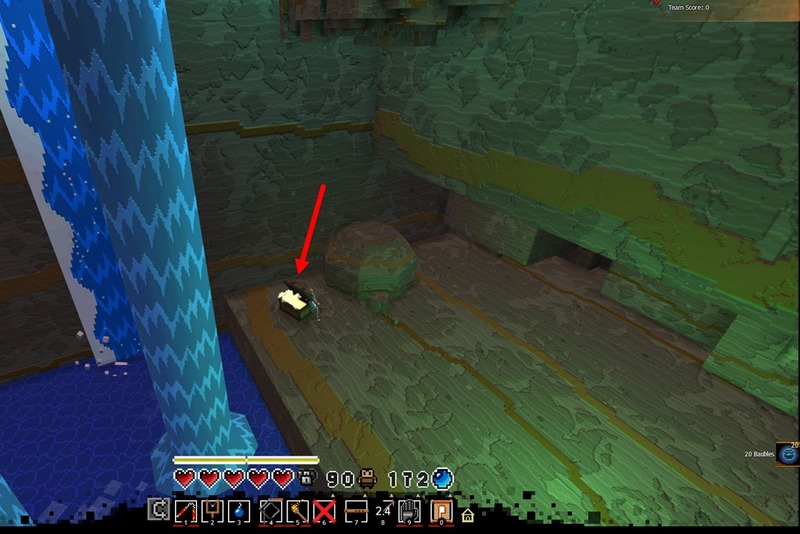 There is a +50 bauble dig spot on the little ledge that hidden room 4 dumps you out onto (after going through the bookcase). Hello Dulfy! Think this is my first post here. Anyway, I found an unlisted +50 Bauble chest near the end of World 2-1. 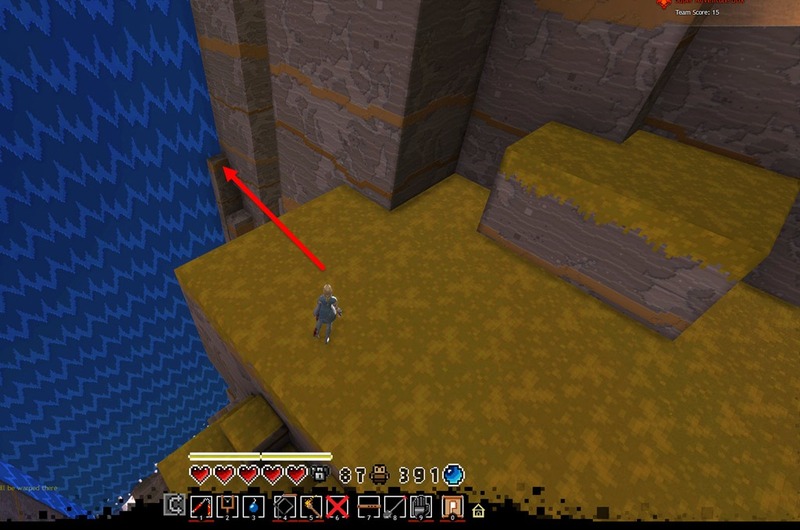 Here are some pictures of its location; it’s halfway down a cliff. There’s no chest shown in the screenshot, but I’ve verified that this one exists. 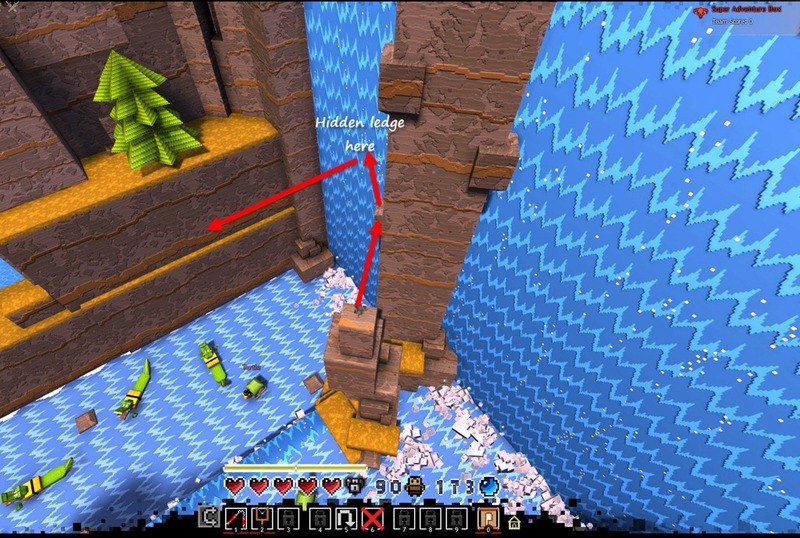 i found 3 places not mentioned in the guide. one is already mentioned below so i’ll skip that one. the first one is just before the climb that leads to the gate with the push block in front of it and the other is just before the gate thats after the door that opens from the 4 pressure plate swtiches. 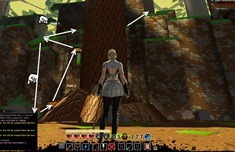 Accessible by navigating through the right path to the Raccoon King/Stump, seen on the left hand side of the attached screenshot, then jumping over and across the Moai heads’ mouths over this corner. 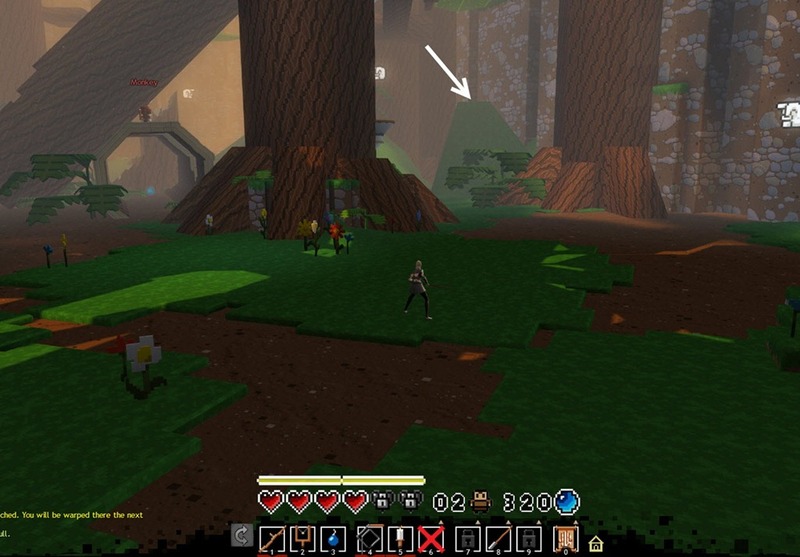 The stump can be seen in the image on the right of the screenshot, so it should be easy enough to find this spot. Is the 2-2 guide complete? Will it be complete before this year’s festival ends (just a few more days only)? Thanks. I found another chest in 2-2 that no one else has mentioned yet. hopefully the picture is good enough because i don’t remember what number gate that is. How many baubles do you get from that chest? Definitely worth digging for if you’re doing a furniture shop run. 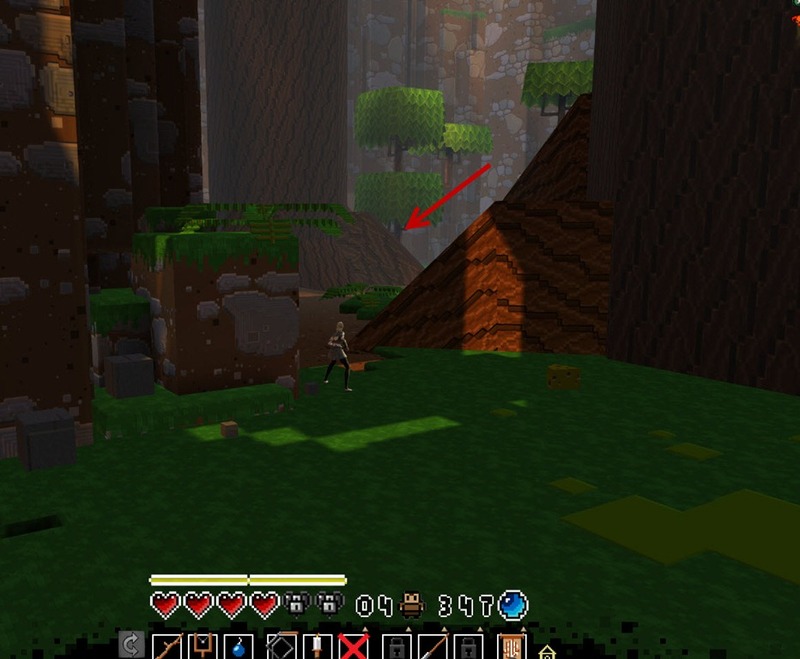 Don’t know if it has been mentioned, but in W1Z3, near the first checkpoint, there is a +10 chest between two trees. 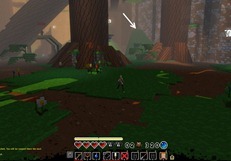 The trees are to the right of the checkpoint.